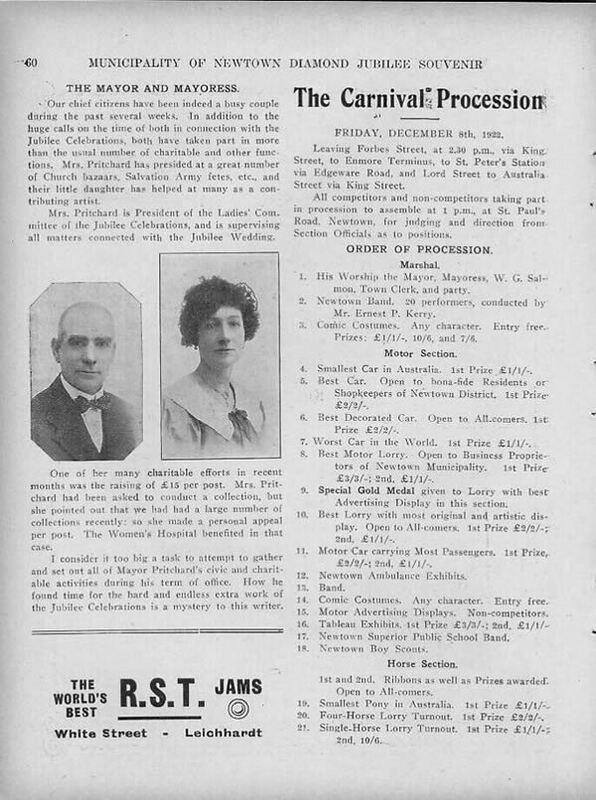 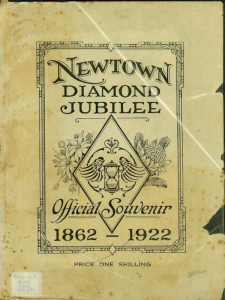 This note describing the contents of the Jubilee Souvenir booklet is intended to help readers find their way through the electronic facsimile version presented on this website. 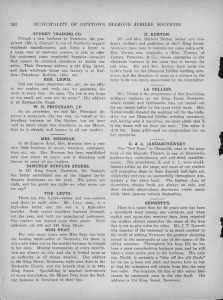 Use the links embedded in this note to find your way directly to the pages described. 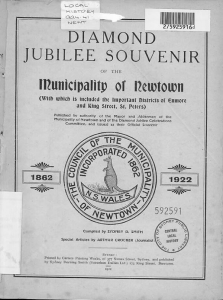 This note covers only the main text of the Souvenir booklet. 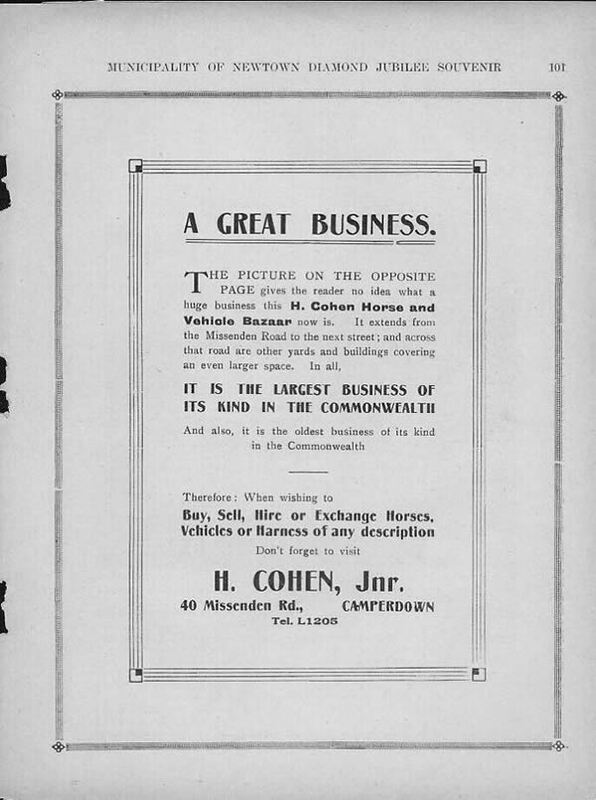 It does not cover the photographs, or advertisements found throughout the booklet. 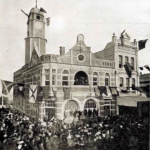 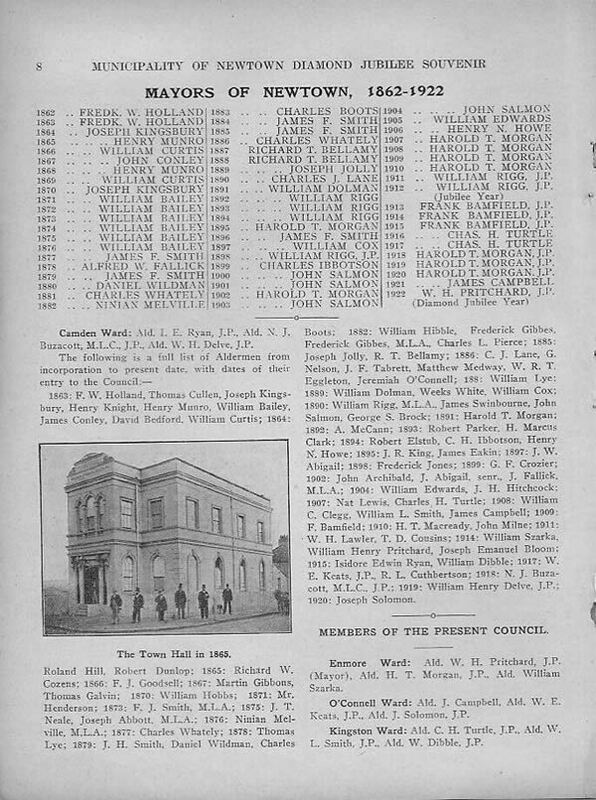 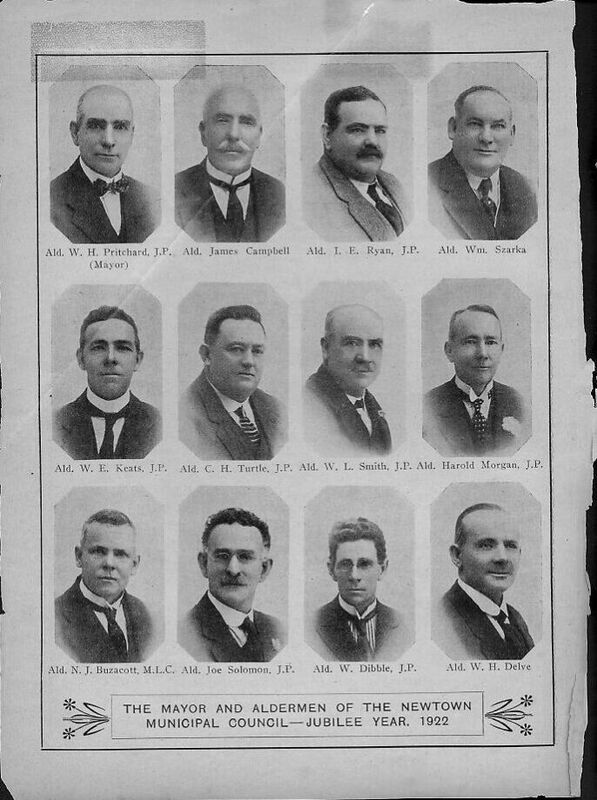 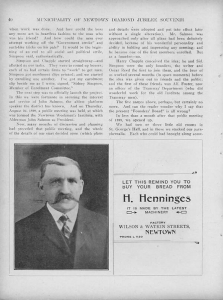 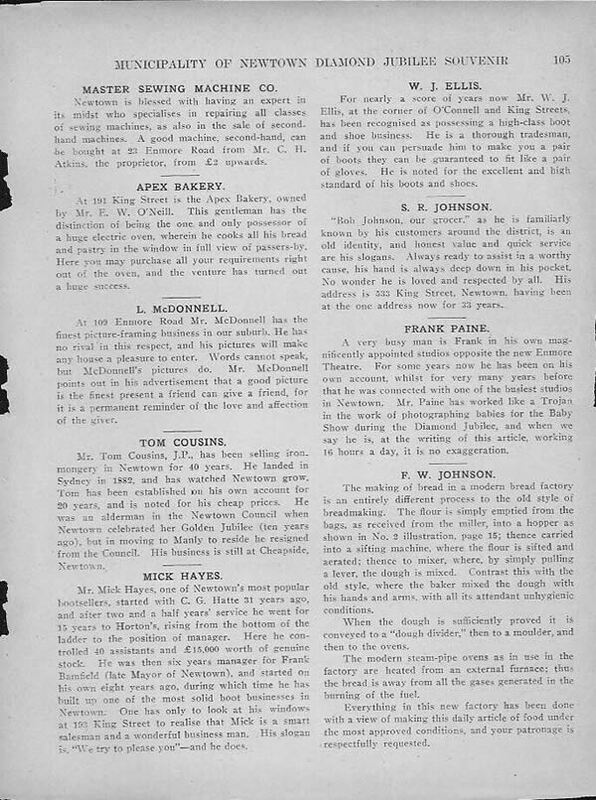 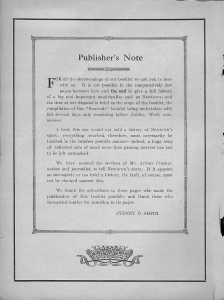 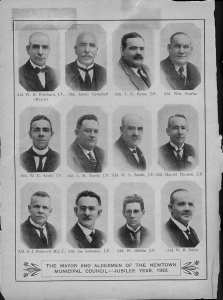 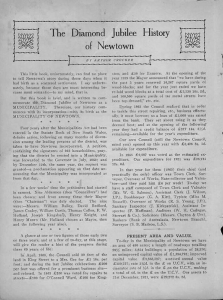 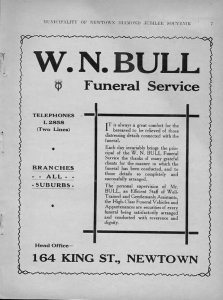 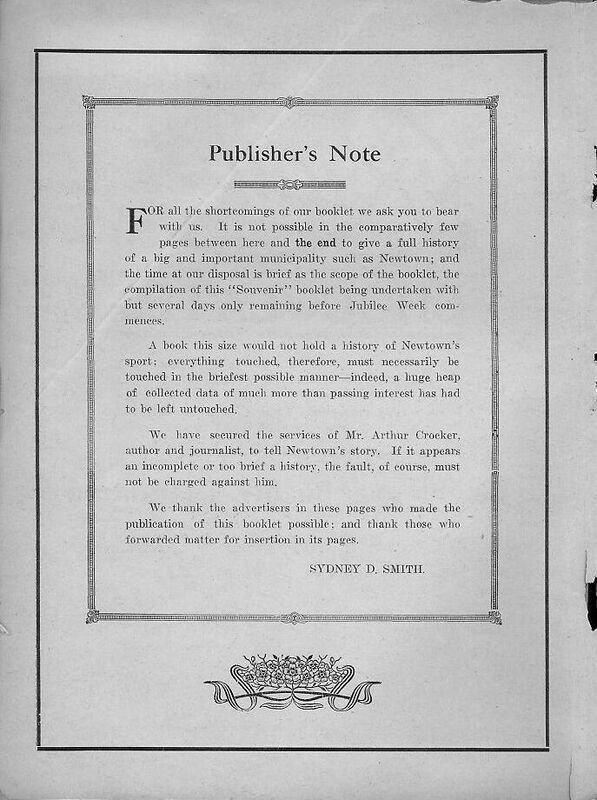 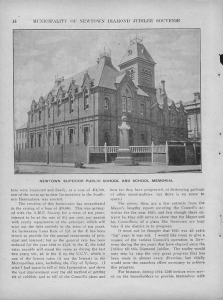 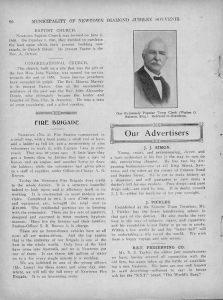 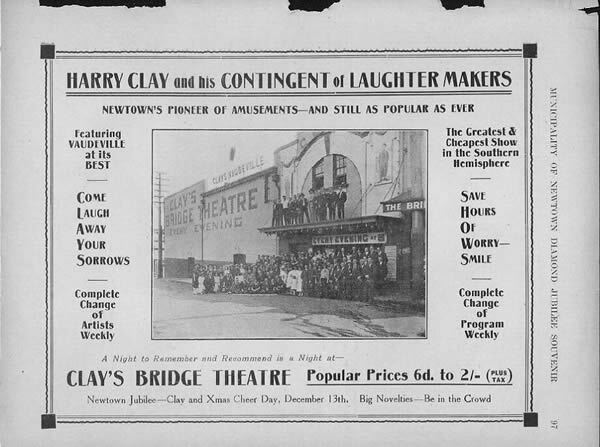 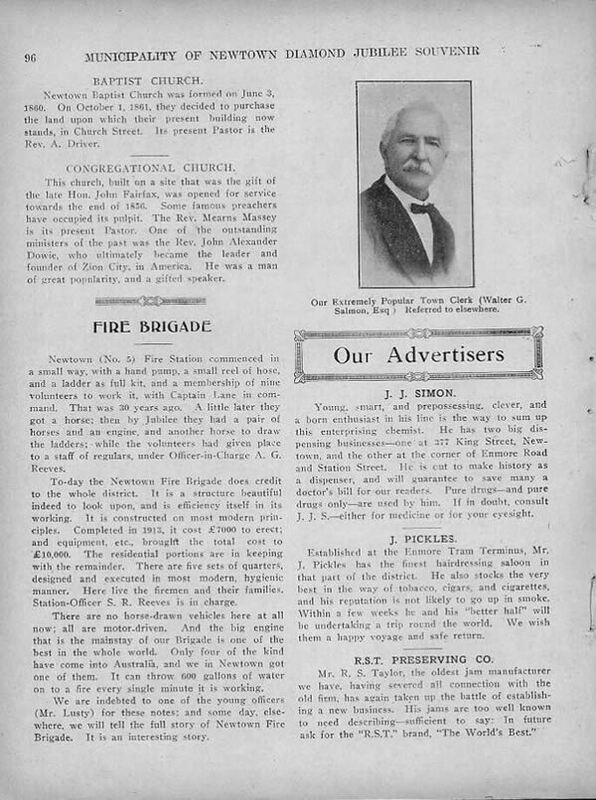 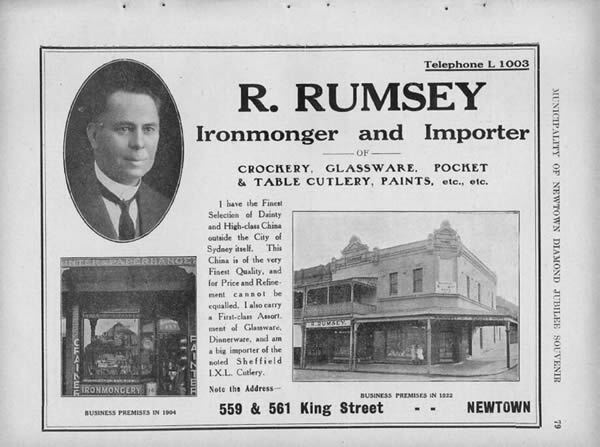 The booklet begins with a note by the publisher, and then follows an extensive section by journalist Arthur Crocker, listing all the Mayors and Aldermen who served on the Newtown Council 1862-1922, and describing the activities of the Council for 1921. 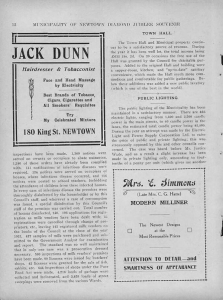 The activities are listed under the headings: public works, public health, Town Hall, public lighting, Hollis Park, Municipal depot, Gladstone St, and Incinerator, and then follows Crocker’s glowing commentary, with additional notes about the toll bar. 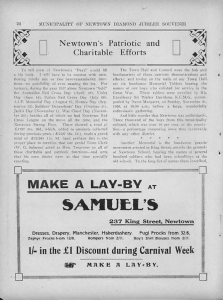 The next major section is Newtown’s Patriotic and Charitable Efforts. 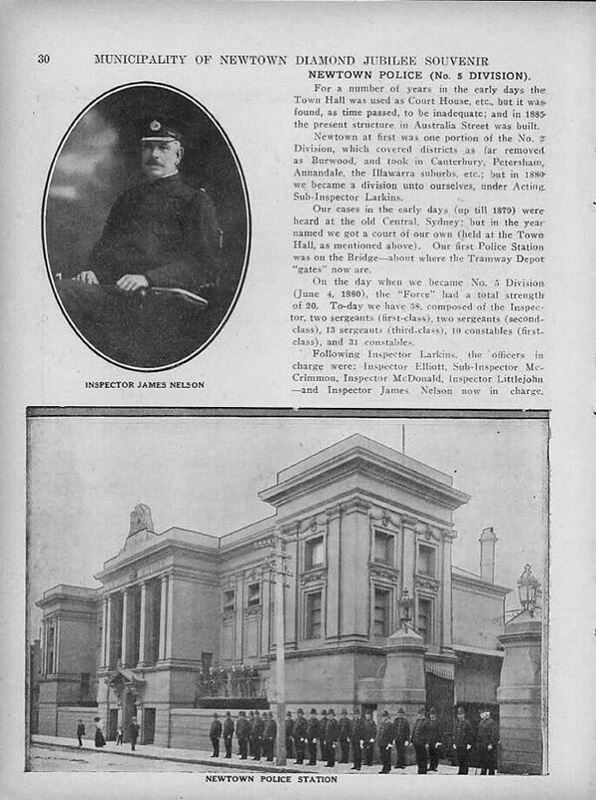 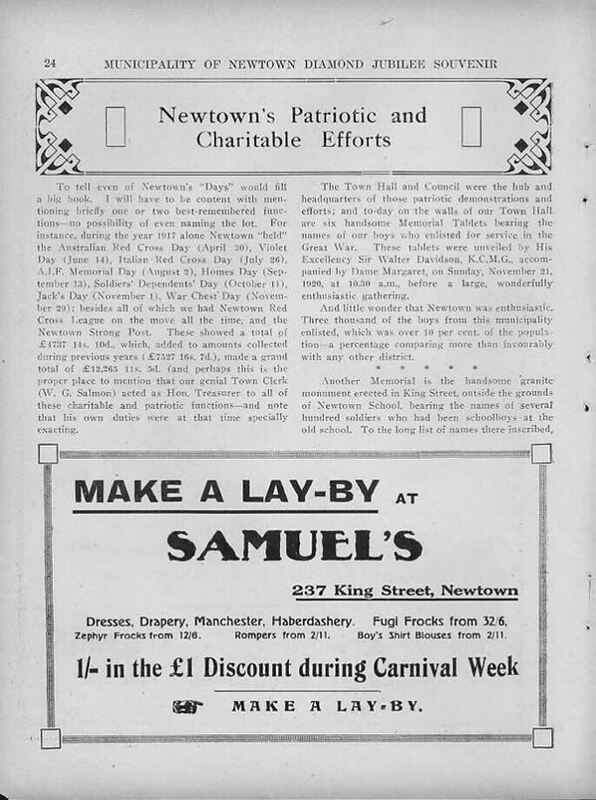 This section contains descriptions of the fundraising and patriotic activities undertaken during the Great War, and the war memorial. 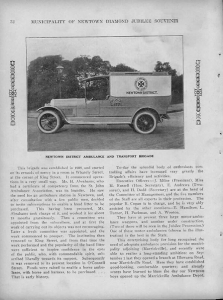 Brief notes about the Post Office and the Newtown police and ambulance services is also squeezed into this section. 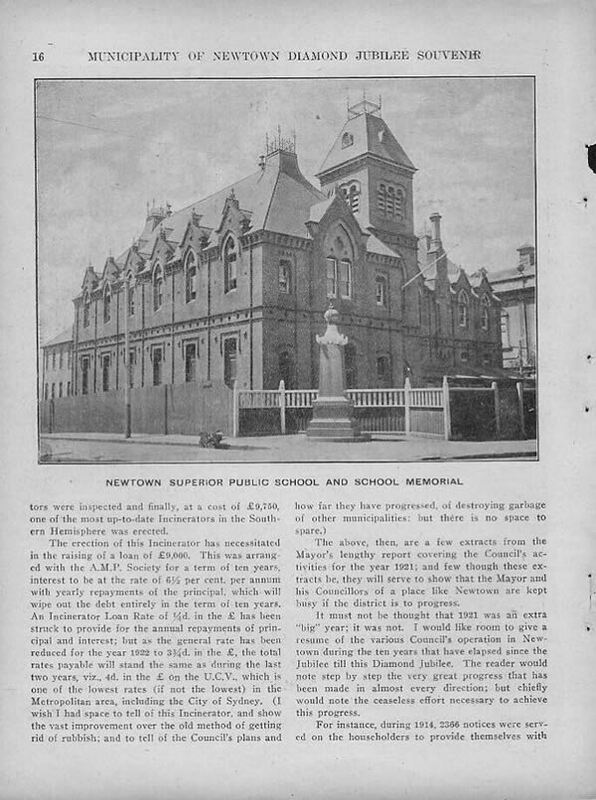 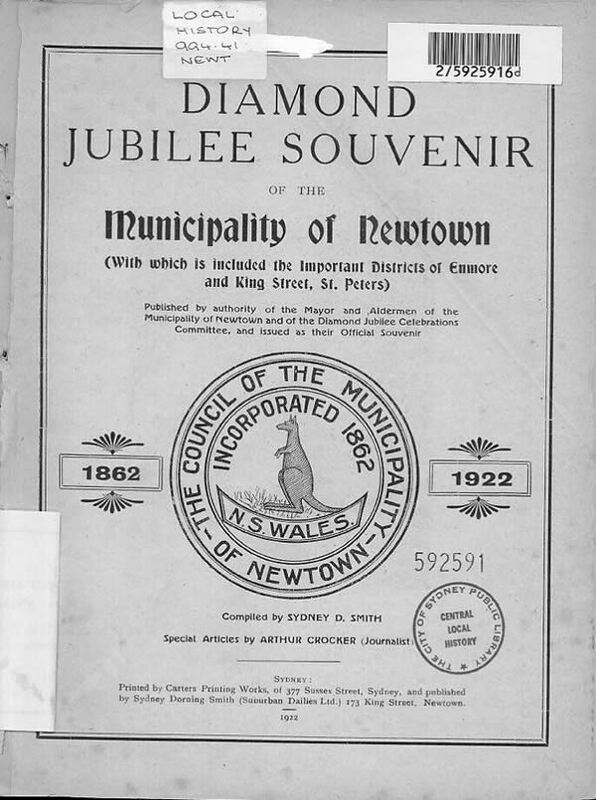 Next the Jubilee Souvenir looks at schools, with a special section for the Newtown School of Arts. 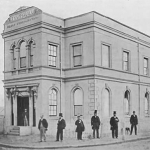 Then follows a section on the Royal Prince Alfred Hospital, and a version of the local ‘urban legend’ about Eliza Donnithorne, supposed to have given Charles Dickens the model for his character Miss Havisham. 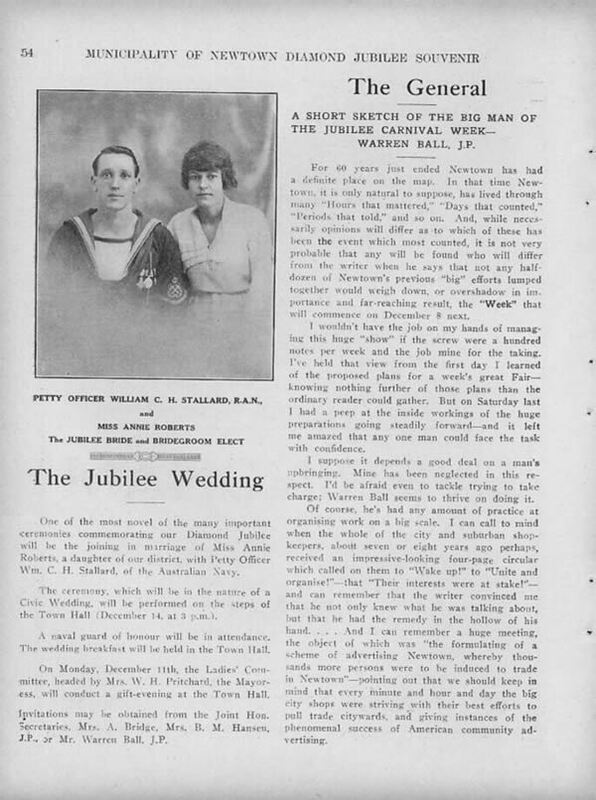 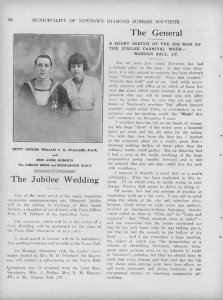 The Jubilee Committee and Ladies’ Committee members are listed (with photographs), and the lucky ‘Jubilee Wedding‘ couple (William Stannard and Annie Roberts) are featured. 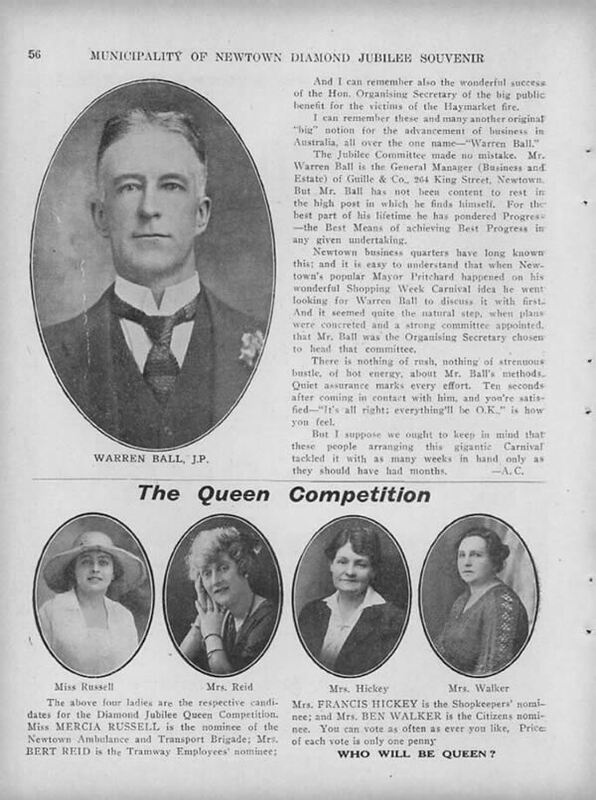 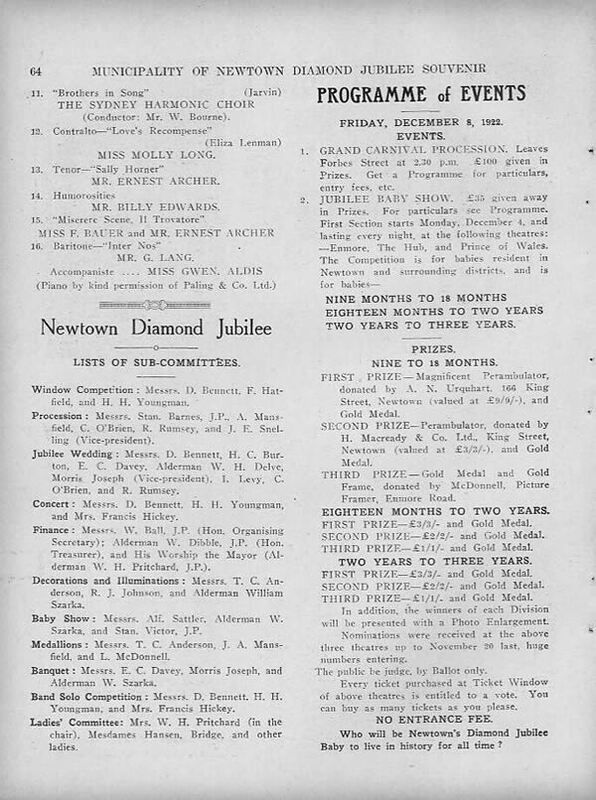 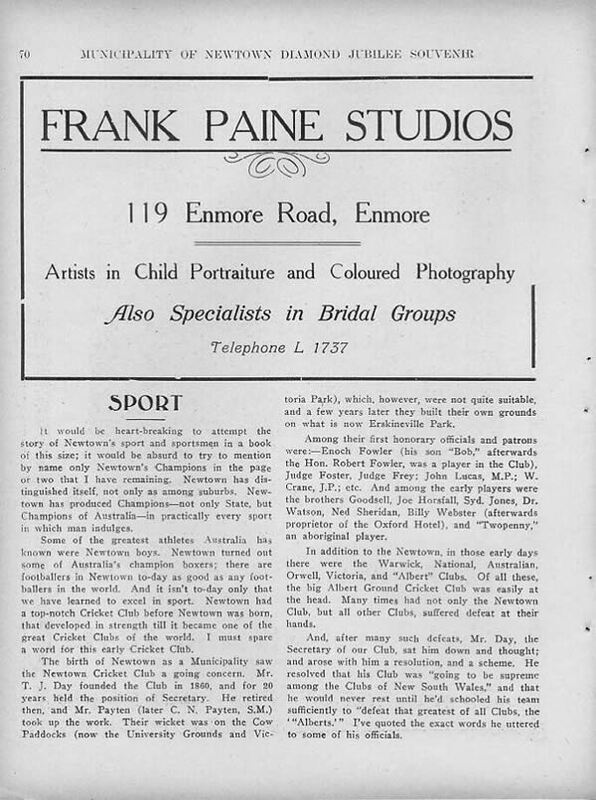 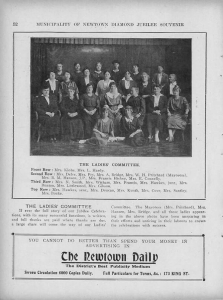 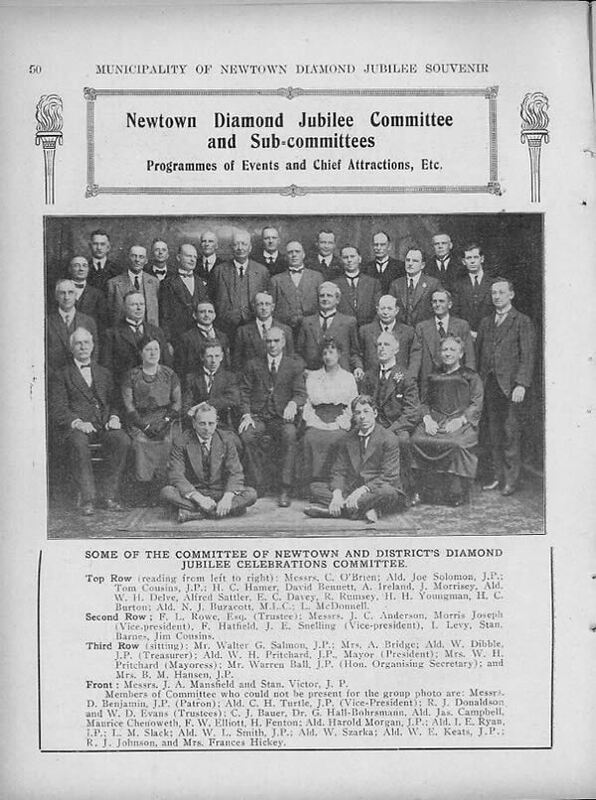 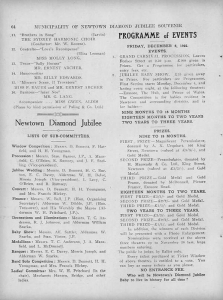 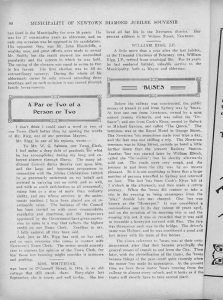 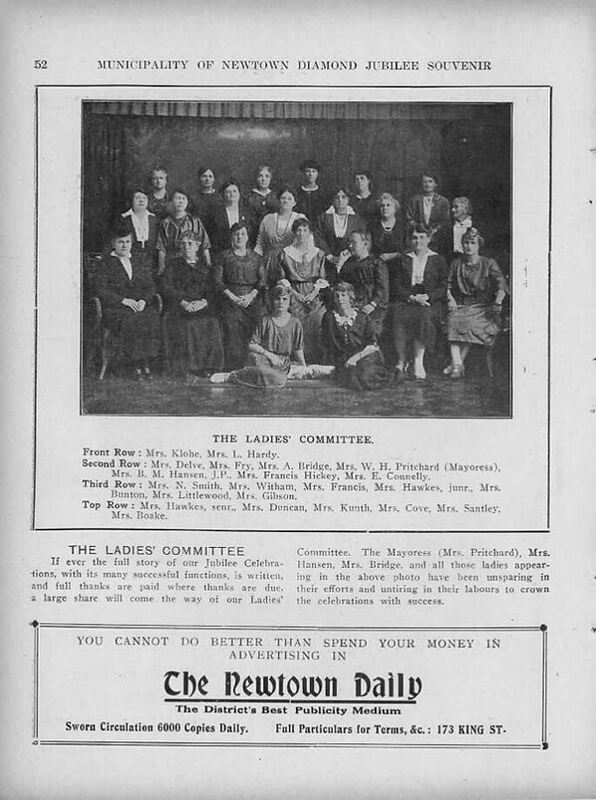 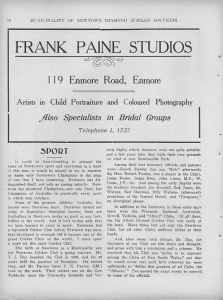 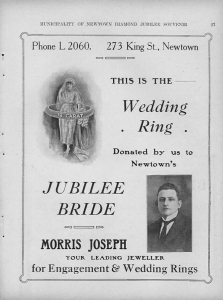 Then we read about the candidates for theDiamond Jubilee Queen Competition, and a biographical note about Warren Ball, J.P., a leading citizen of Newtown and moving force in the celebrations. 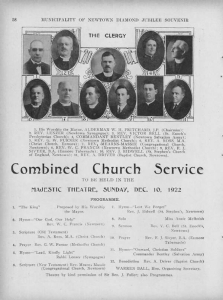 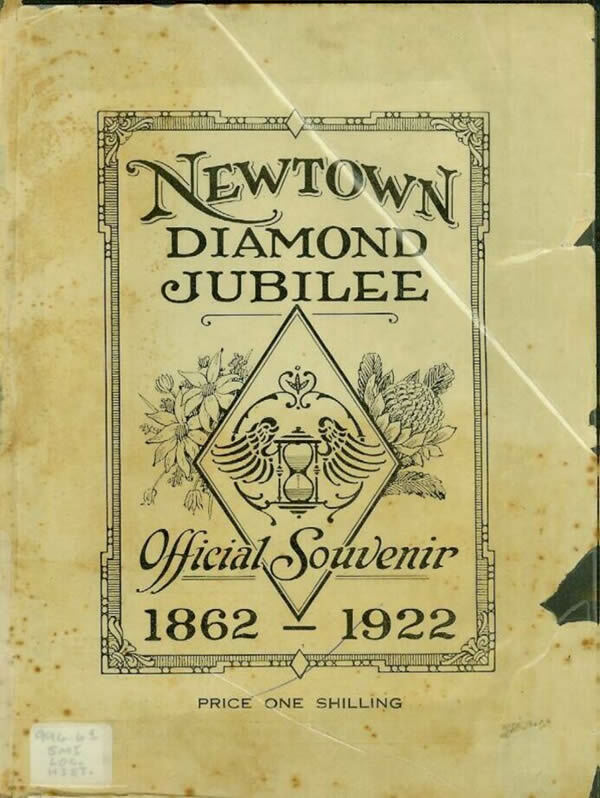 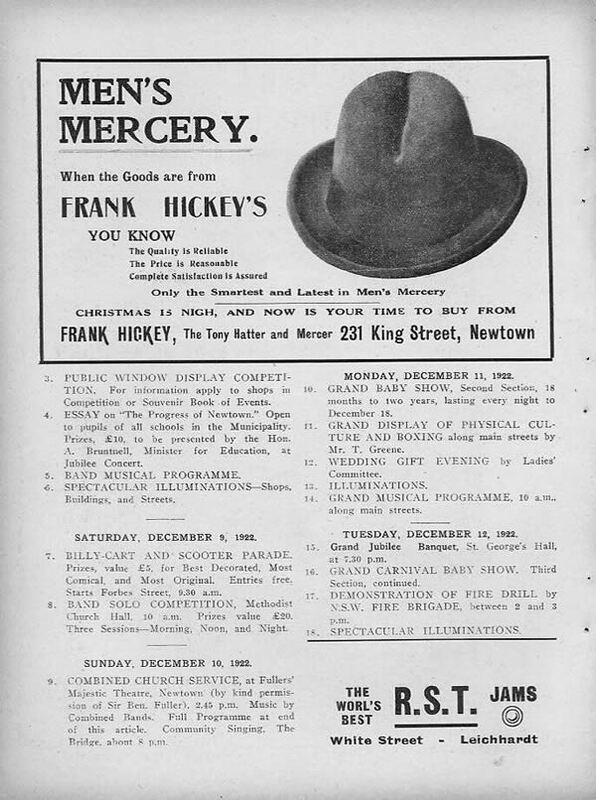 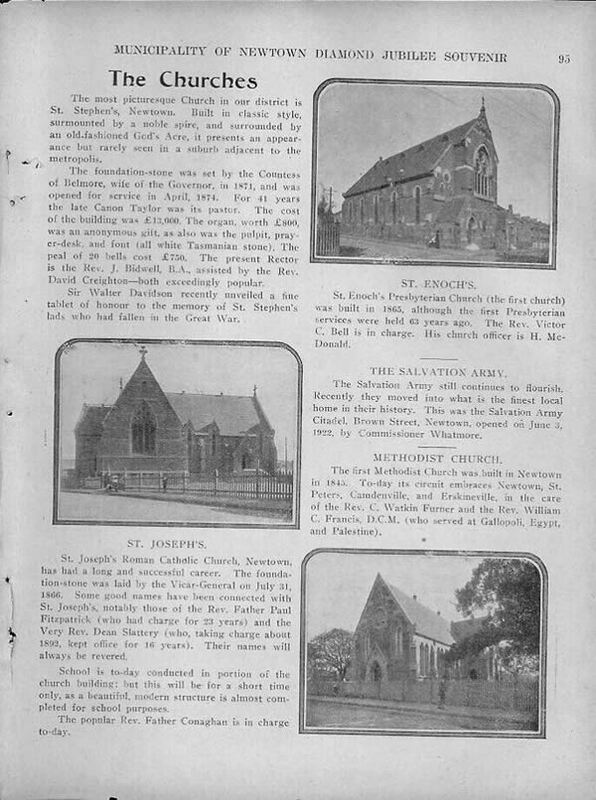 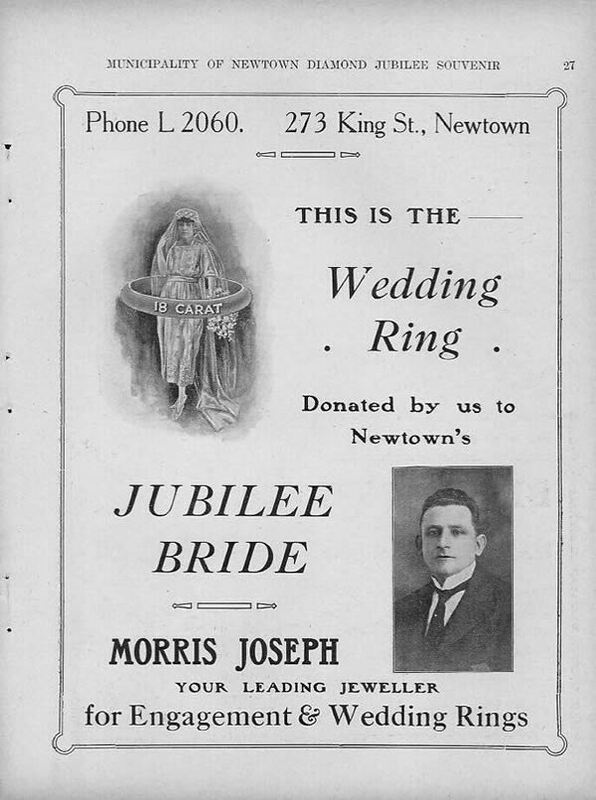 The Souvenir booklet then devotes several pages to events organised to celebrate the Diamond Jubilee of Newtown: the combined church service, the carnival procession and the band solo competition and grand concert. 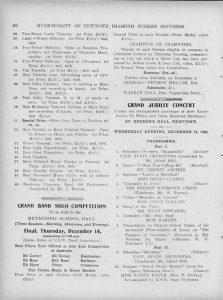 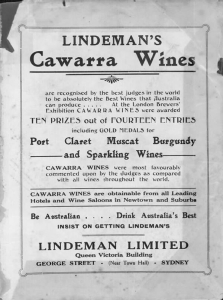 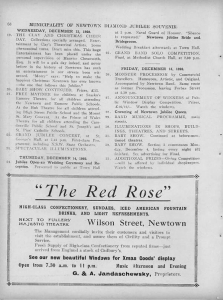 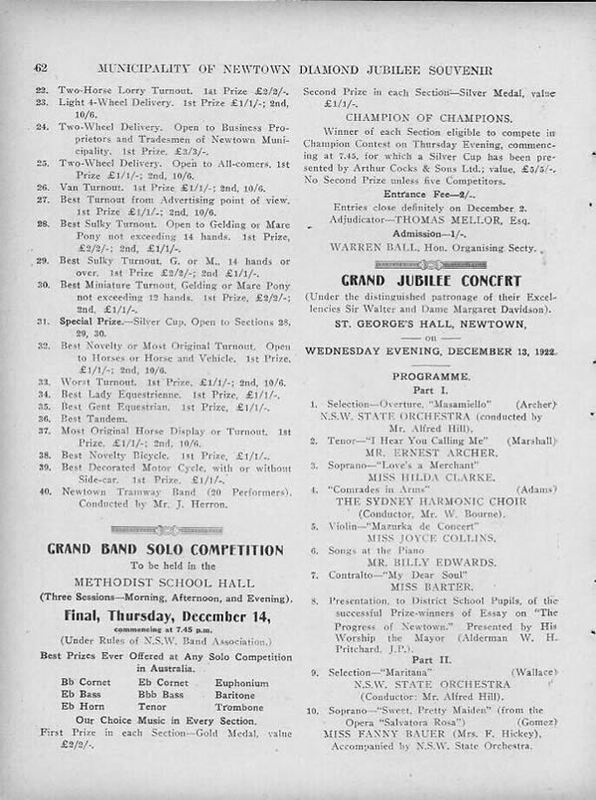 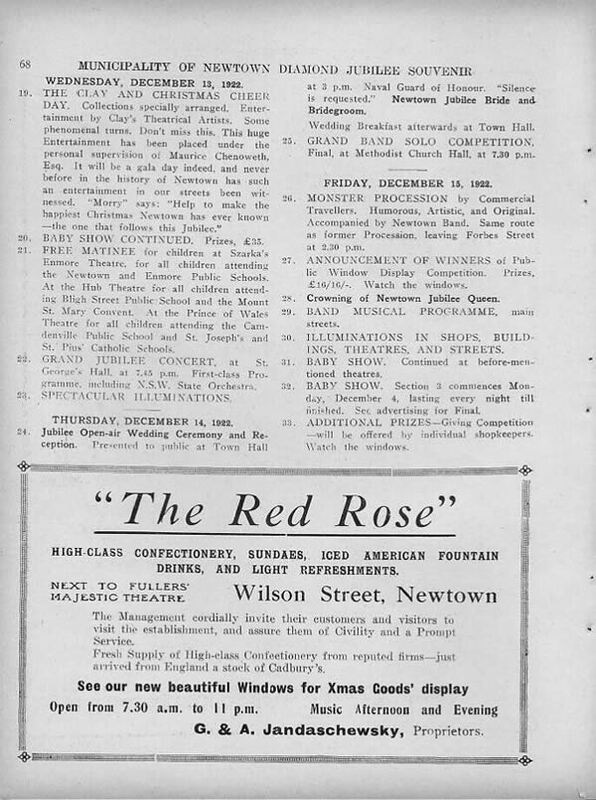 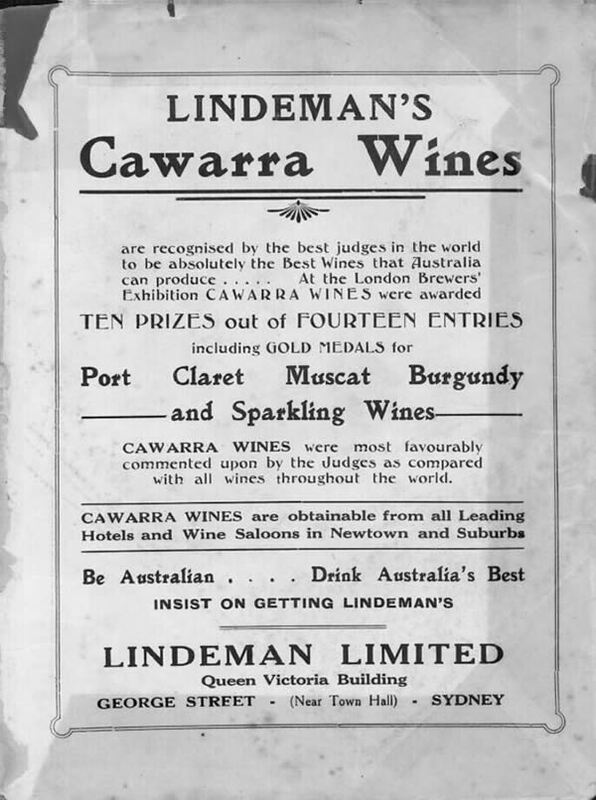 This section also pays tribute to the role of the Mayor and Mayoress, lists members of the different subcommittees (the window competition, decorations and other subcommittees) and gives a detailed program for the events to be held on the week of 8th-15th December 1922 . 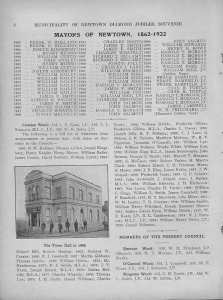 Local sporting activity occupies a large section of the booklet, with descriptions of local boxers and cricketers, rugby codes, swimmers and athletes. 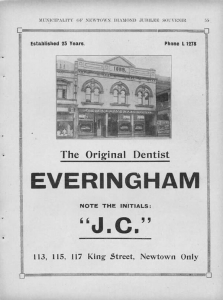 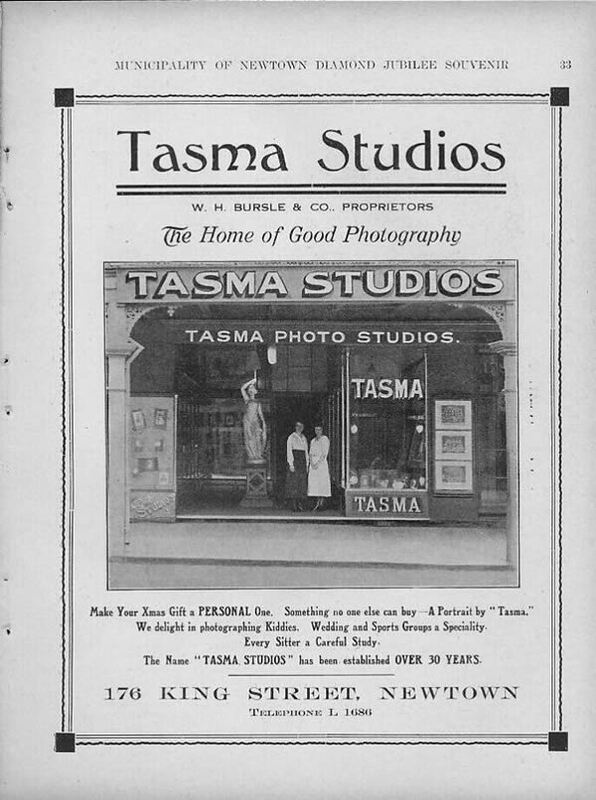 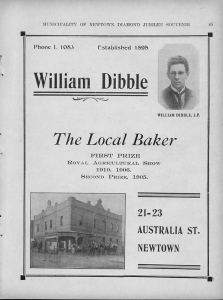 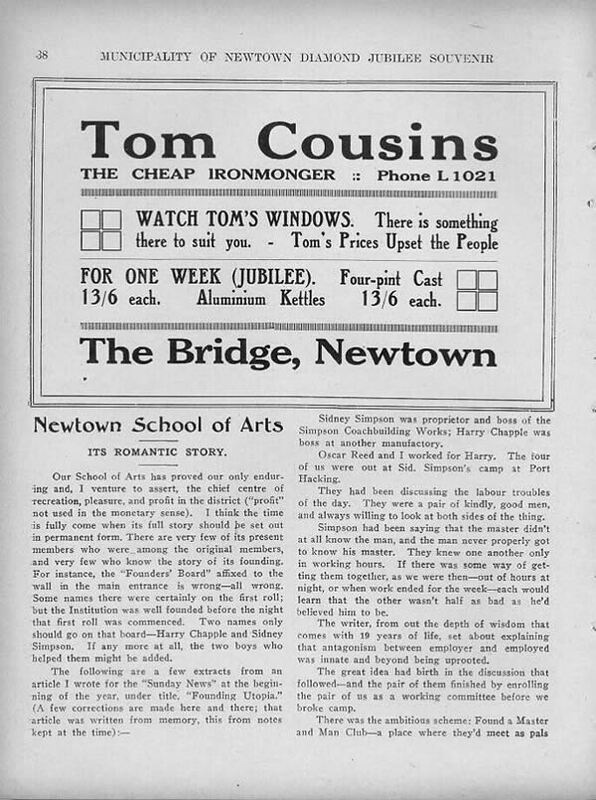 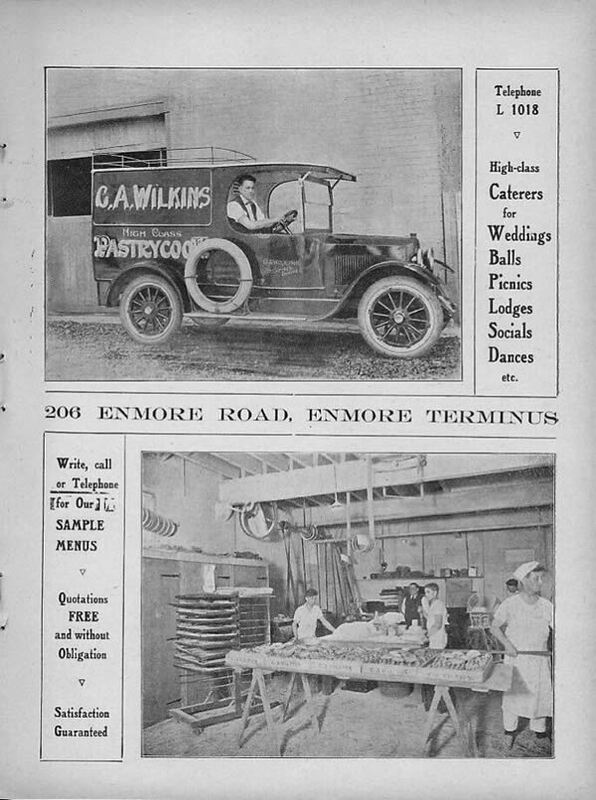 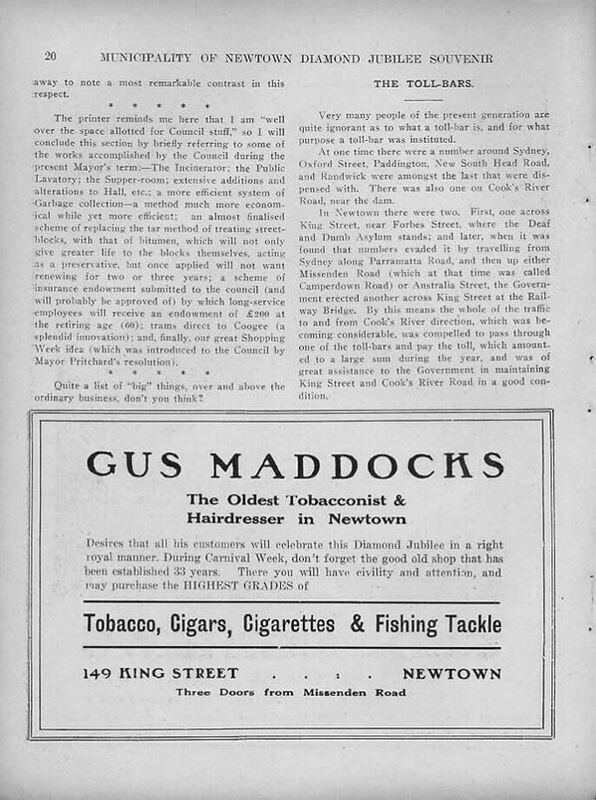 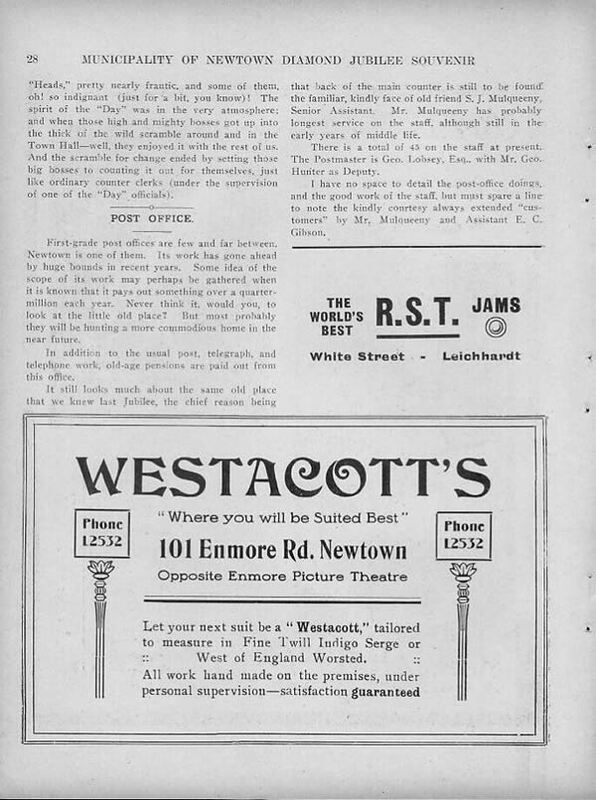 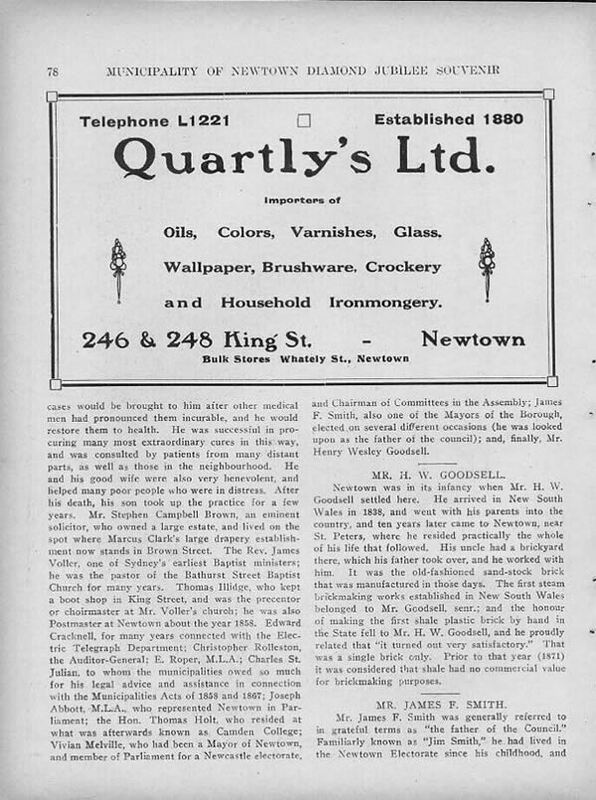 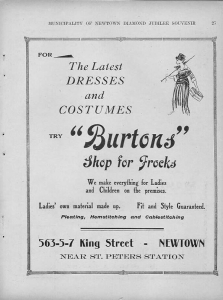 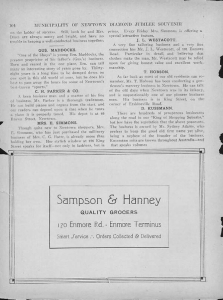 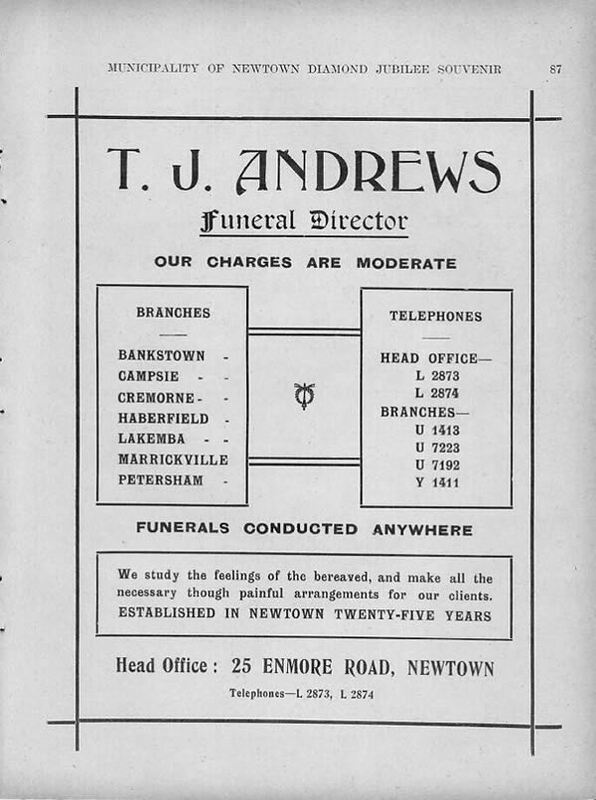 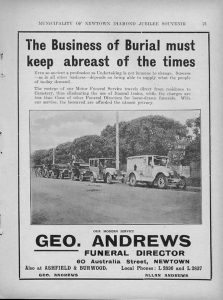 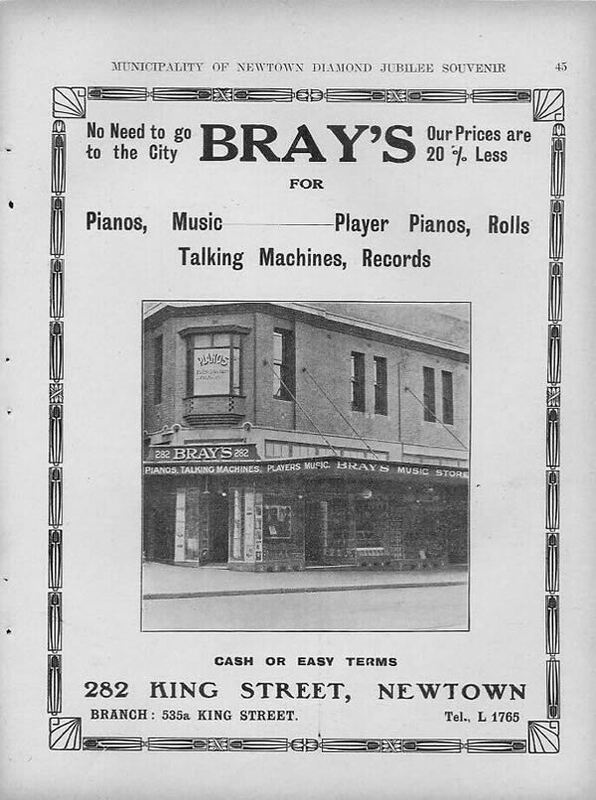 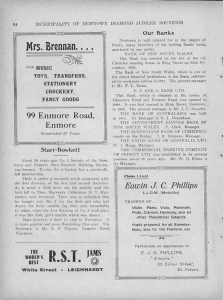 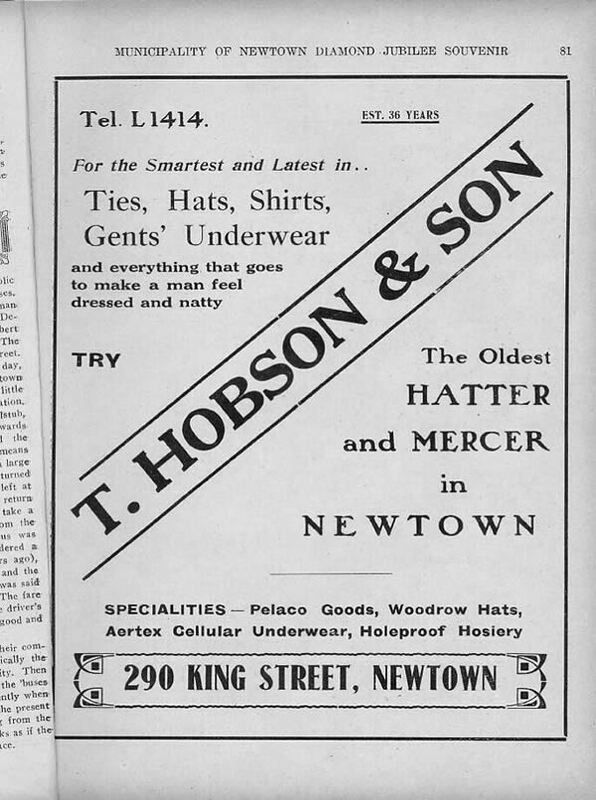 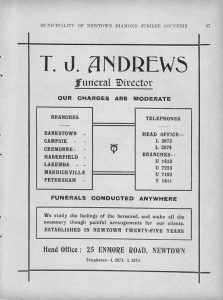 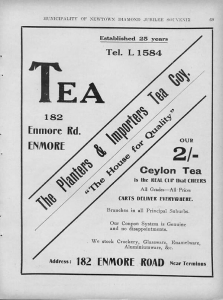 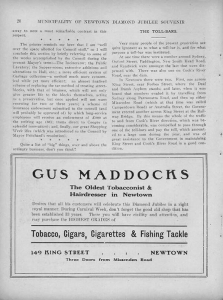 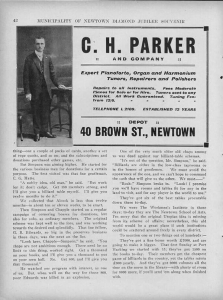 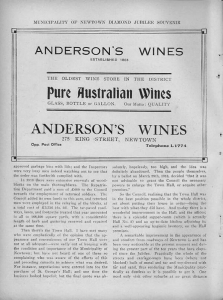 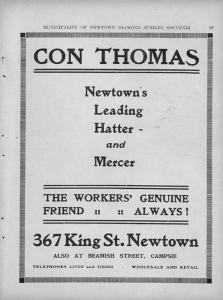 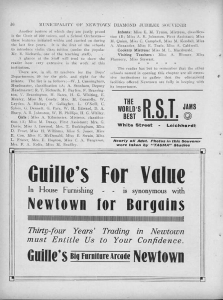 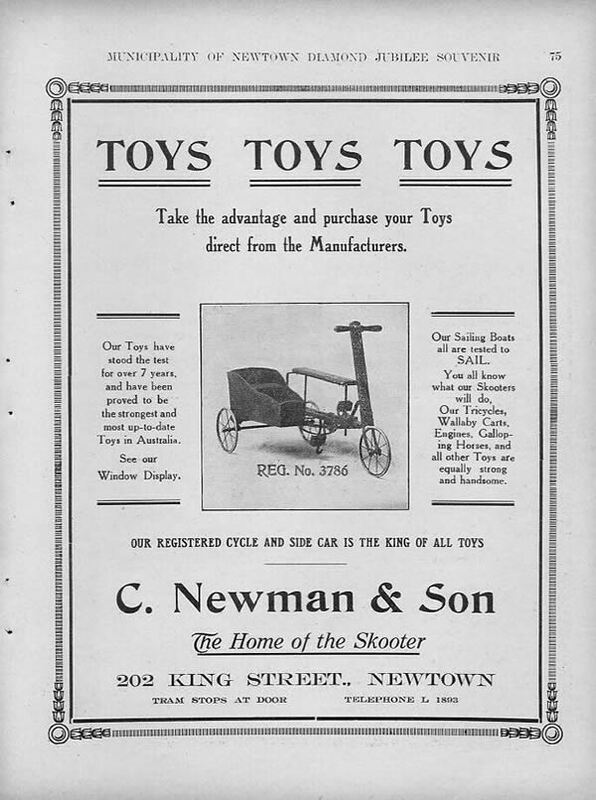 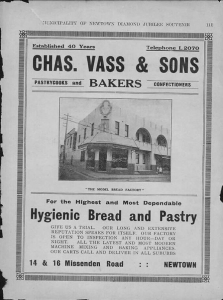 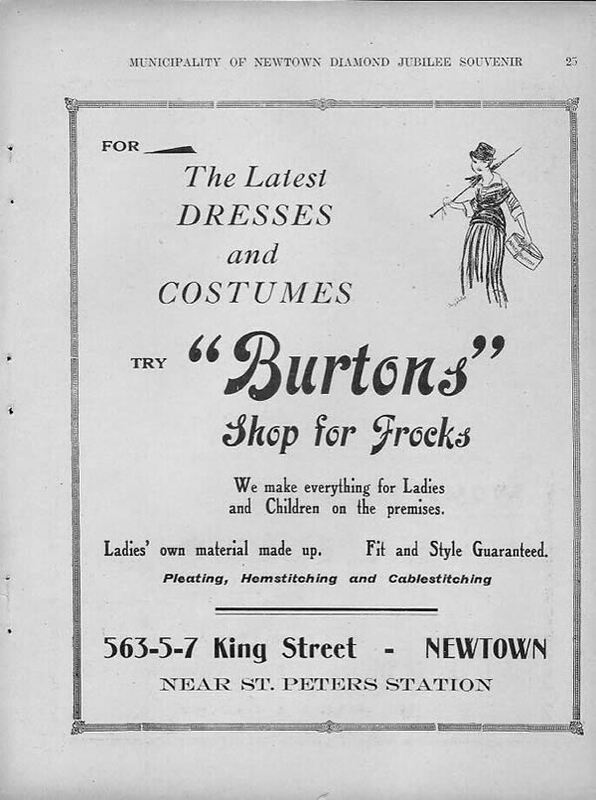 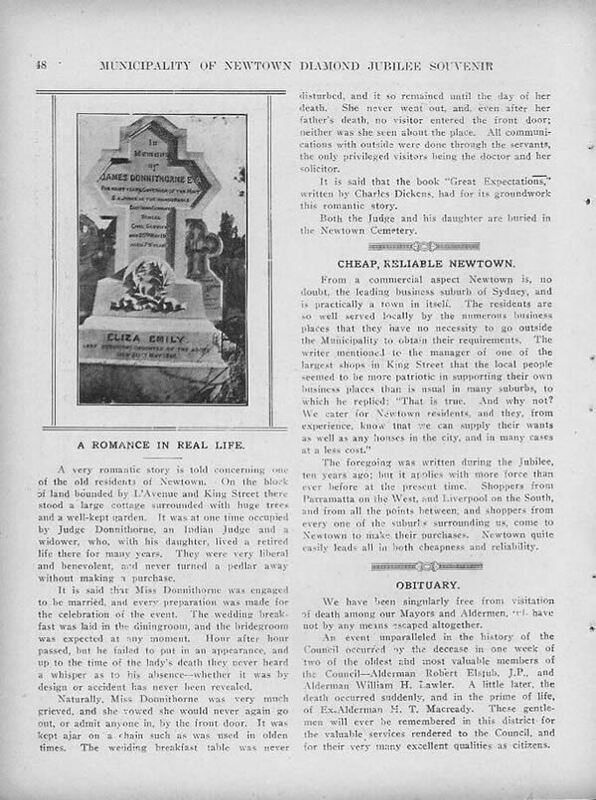 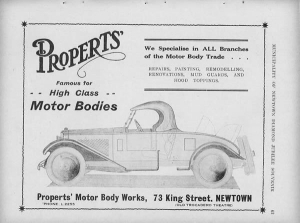 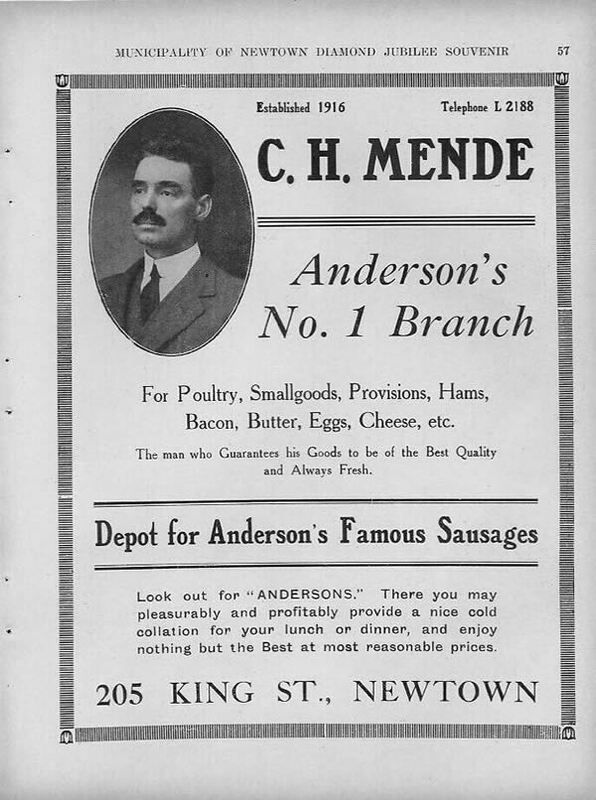 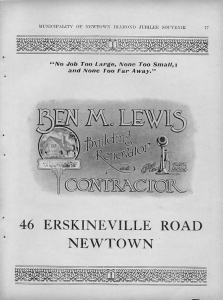 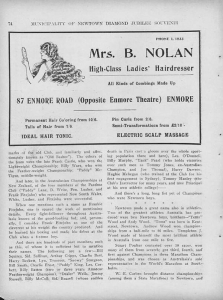 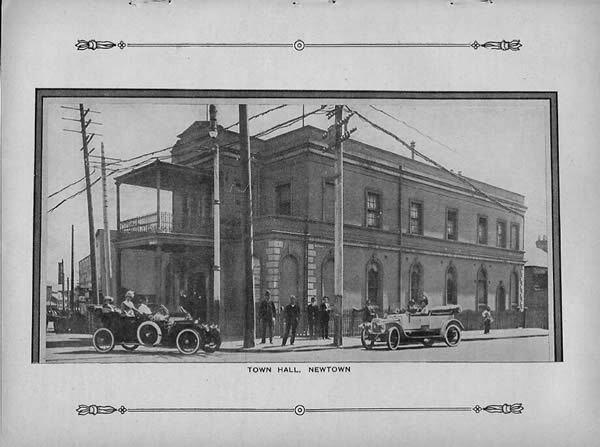 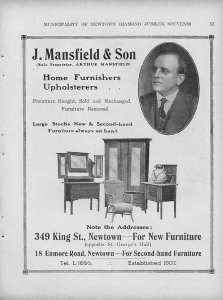 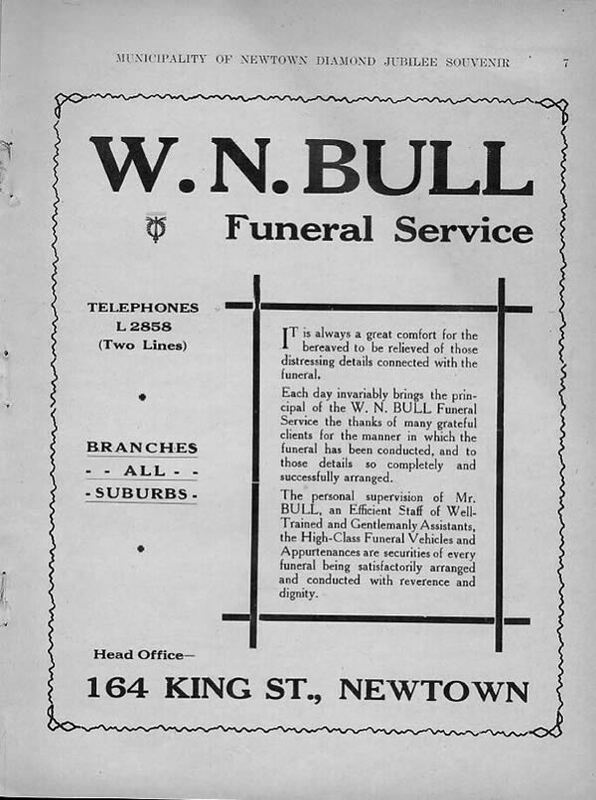 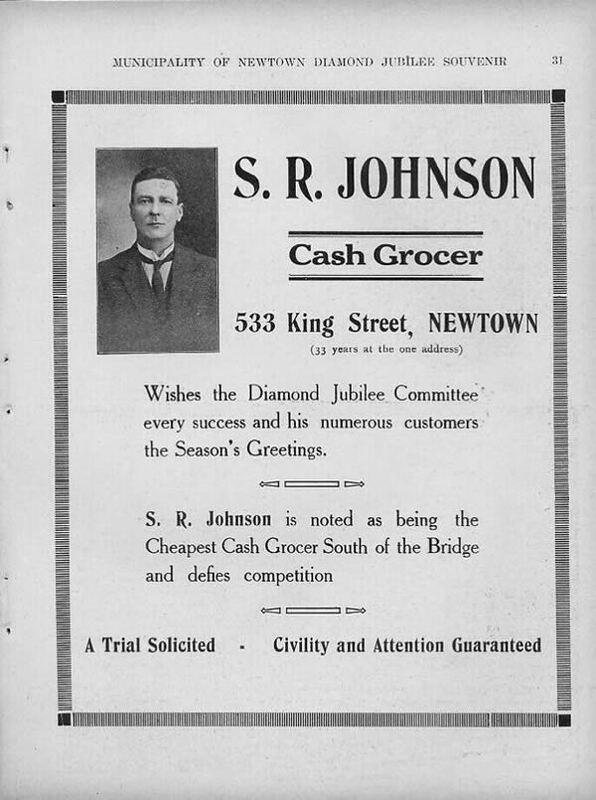 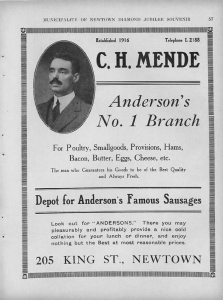 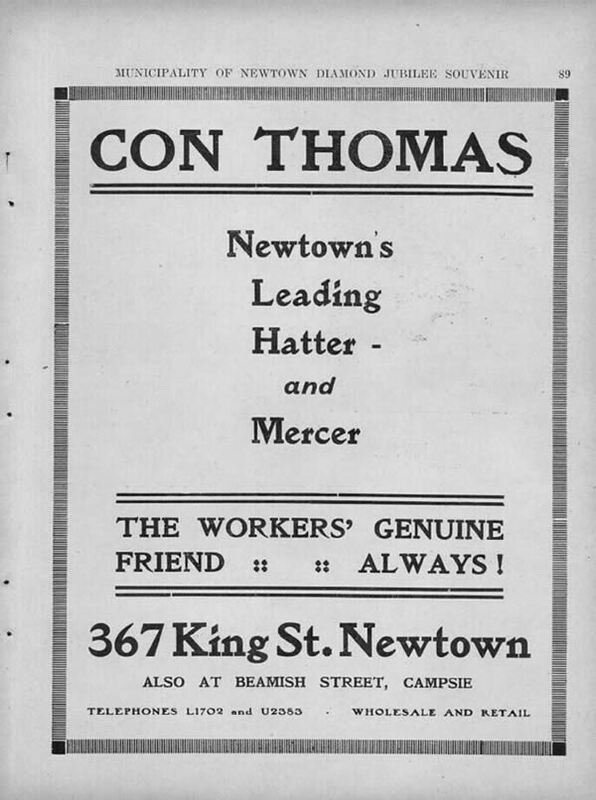 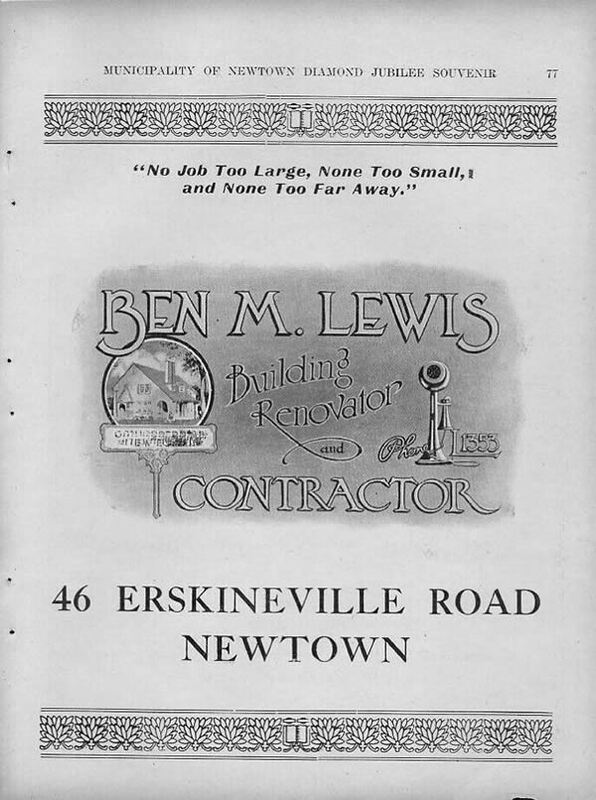 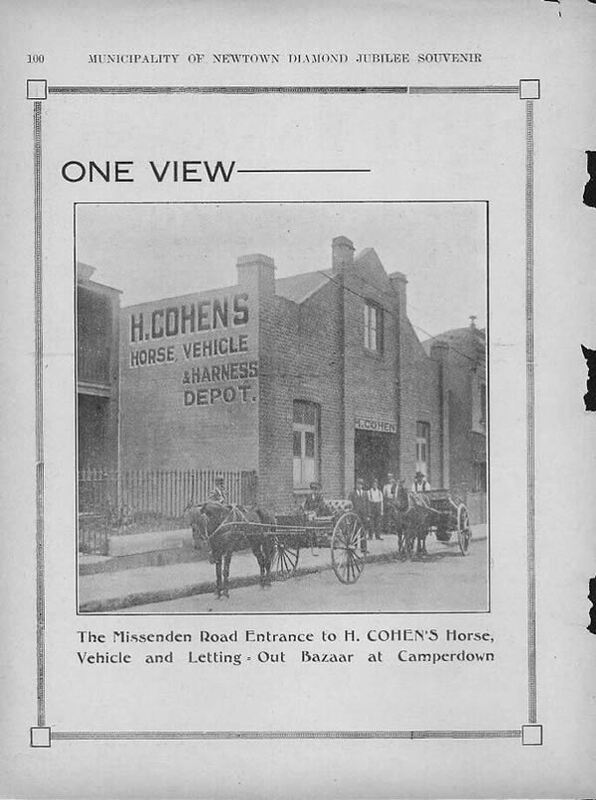 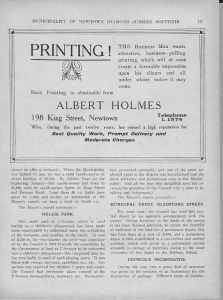 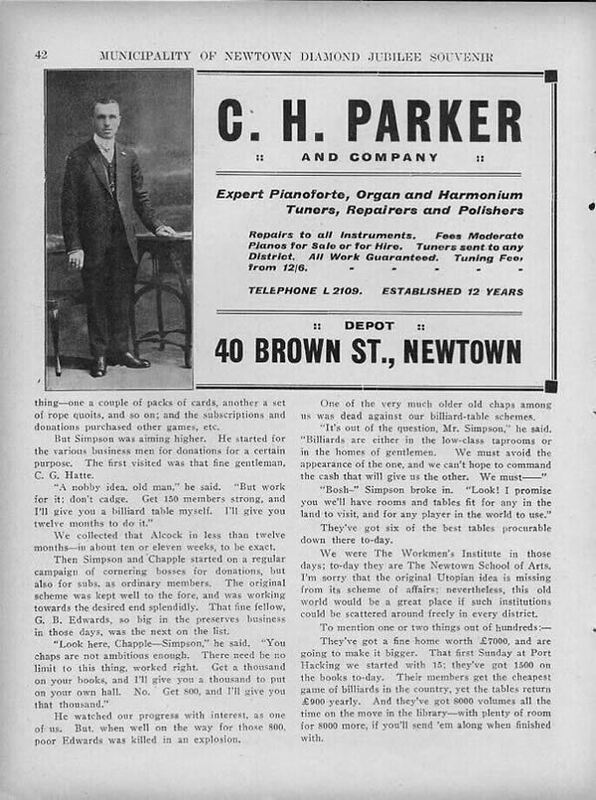 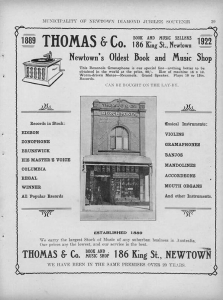 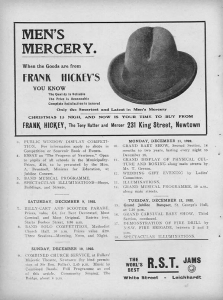 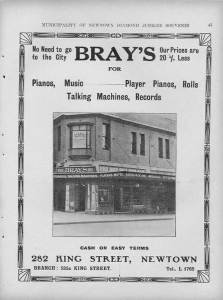 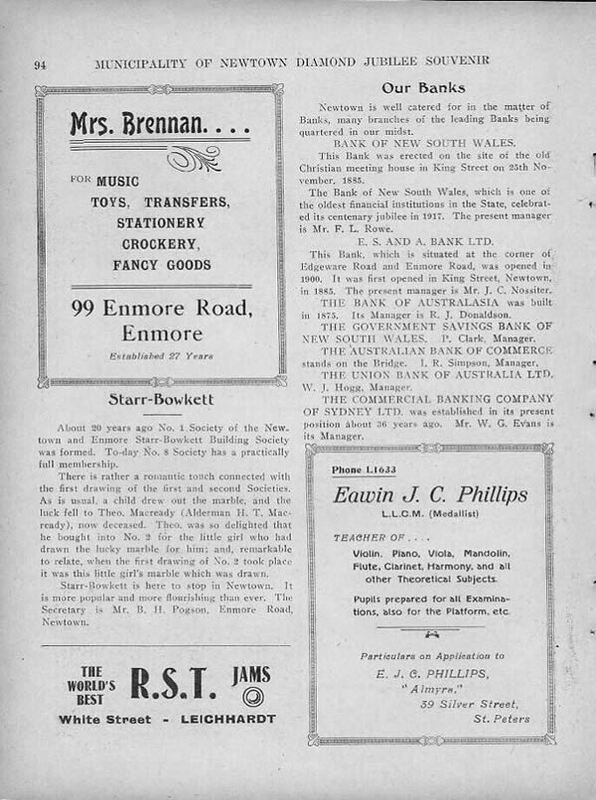 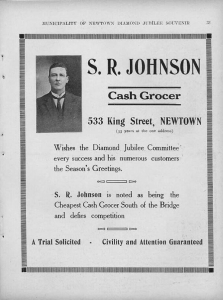 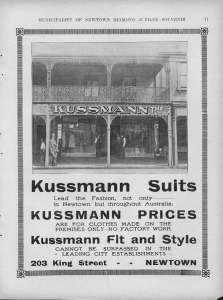 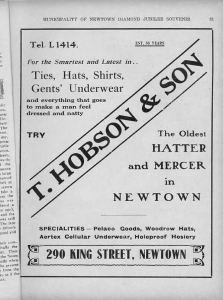 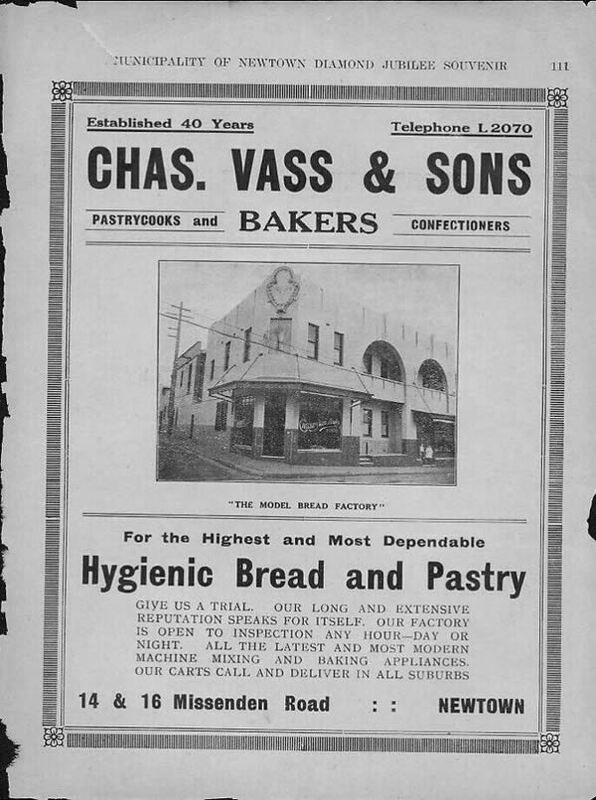 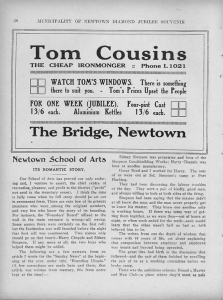 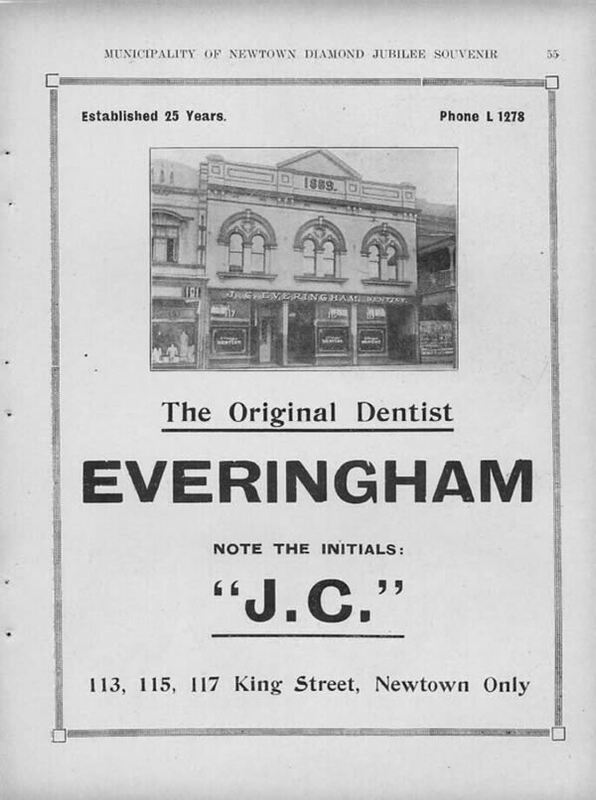 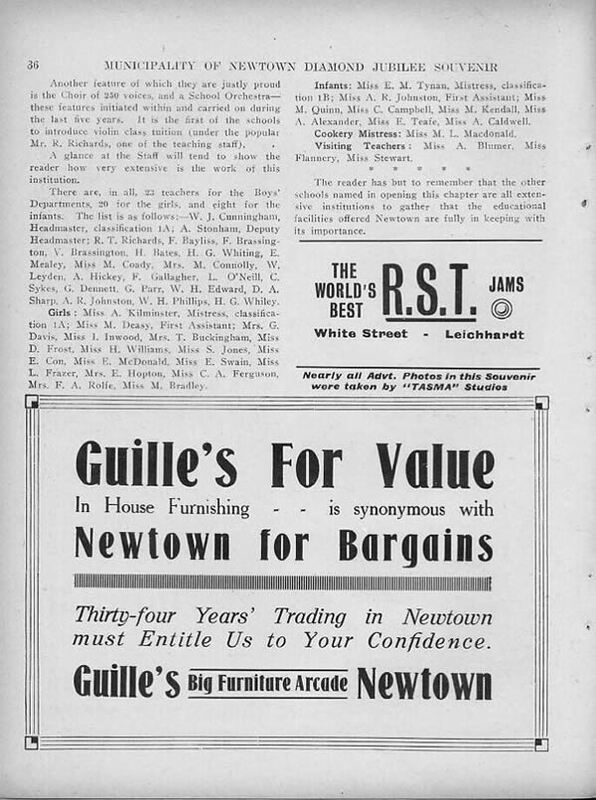 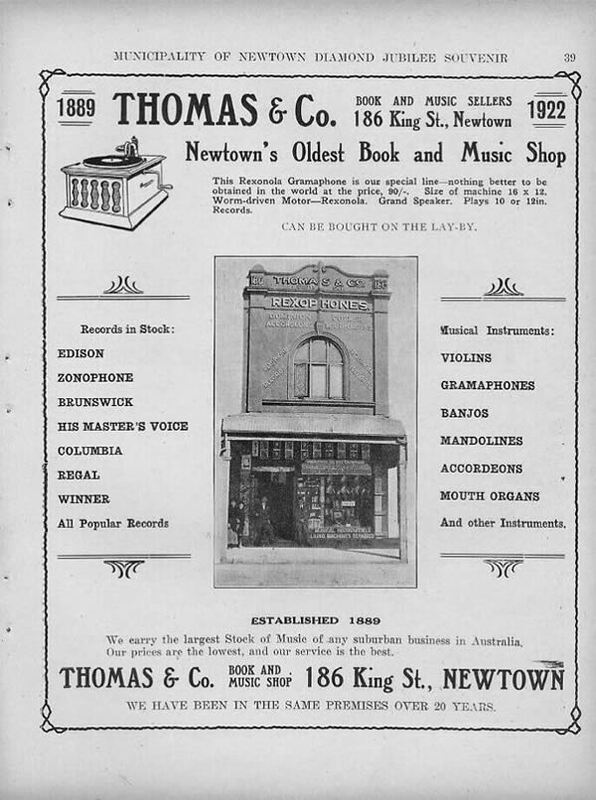 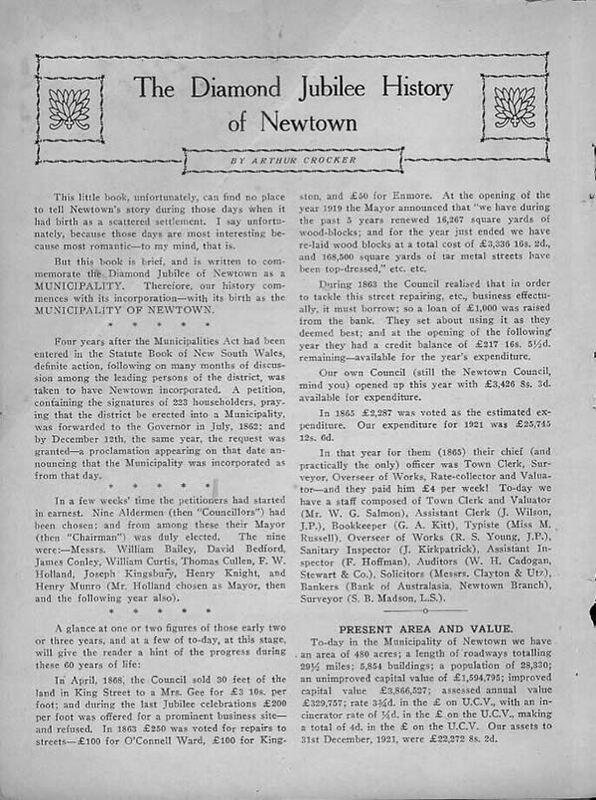 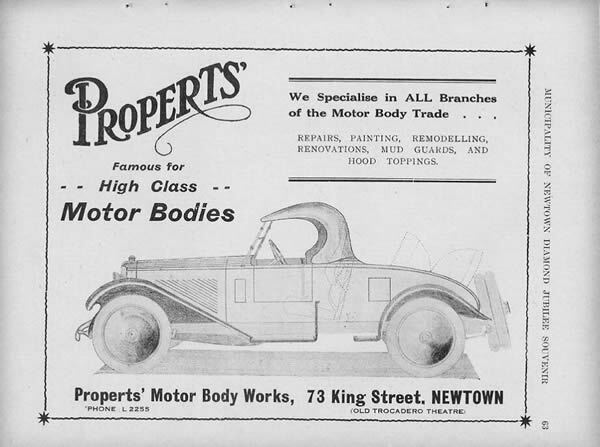 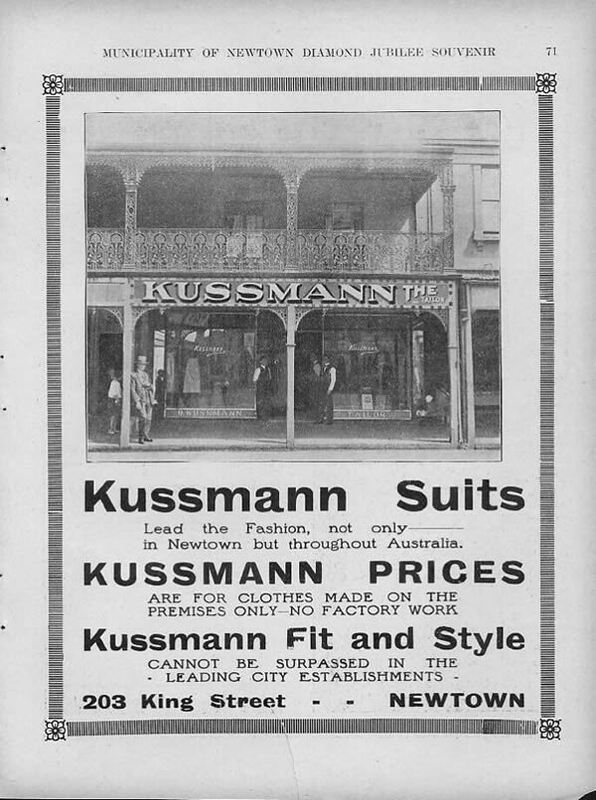 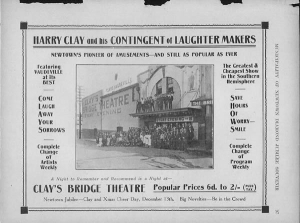 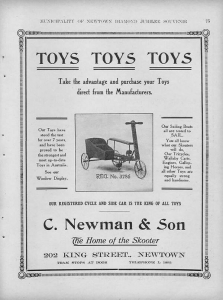 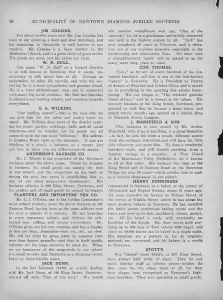 Prominent former citizens of Newtown are also featured, a short section on horse-drawn and motor buses followed by a profile of the Sweet Bros business based in Newtown. 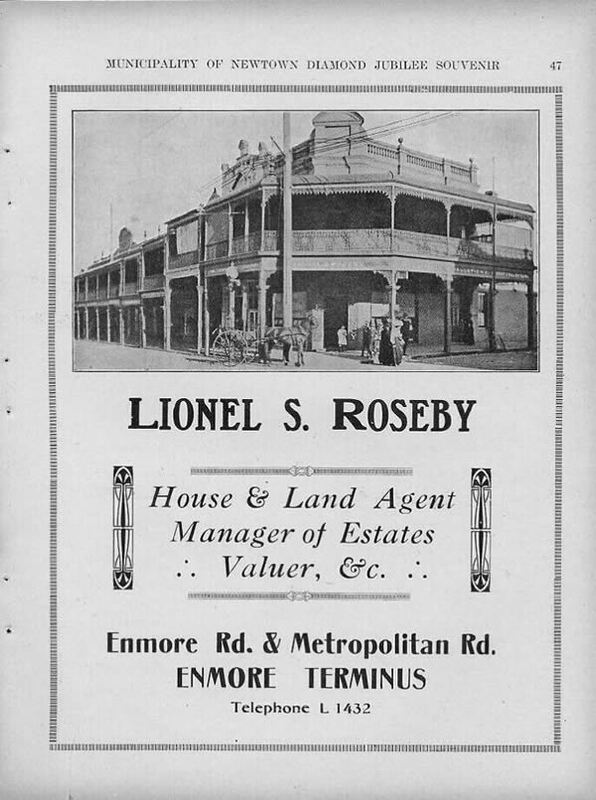 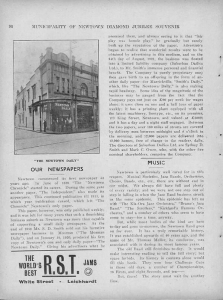 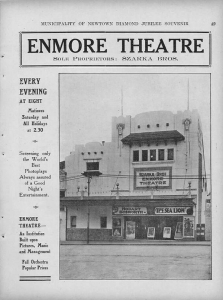 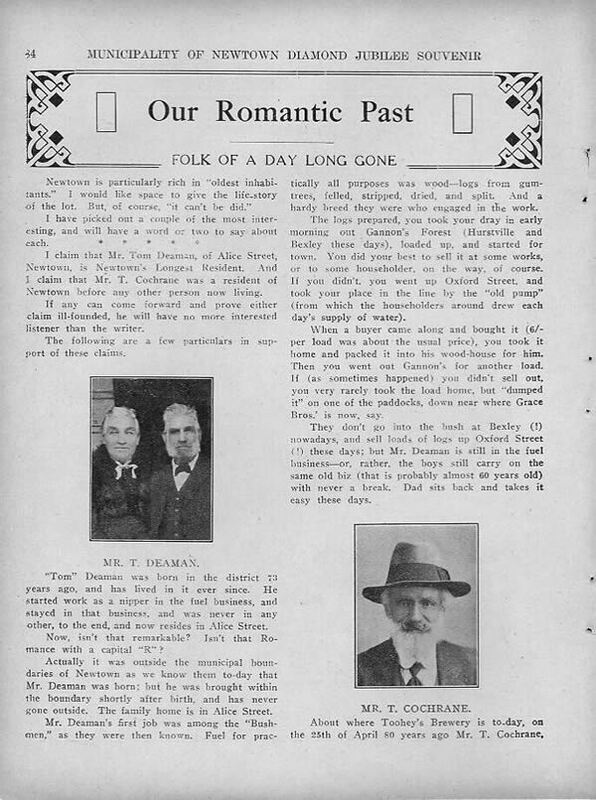 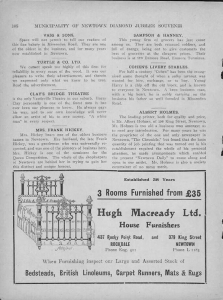 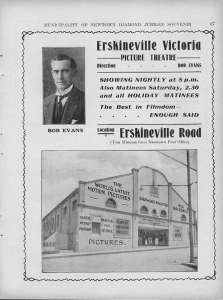 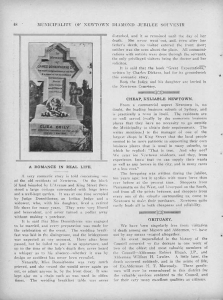 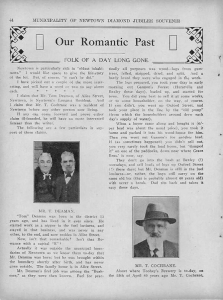 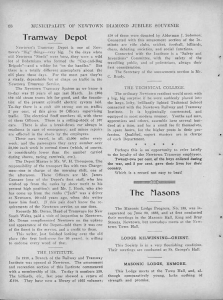 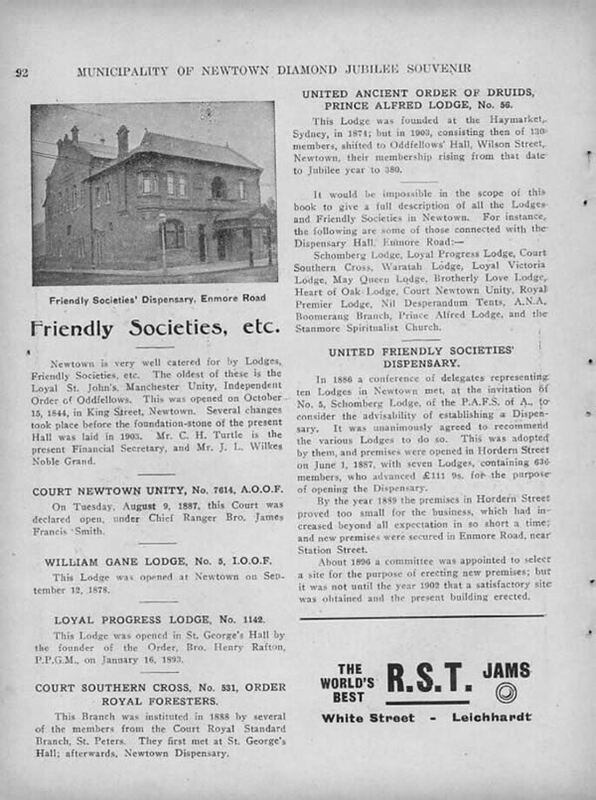 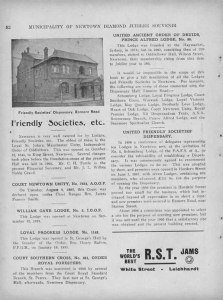 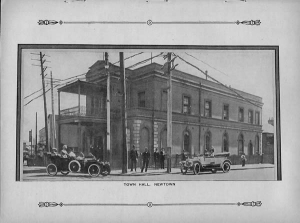 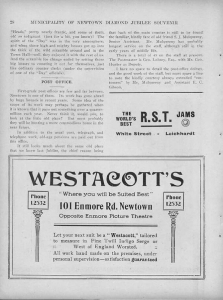 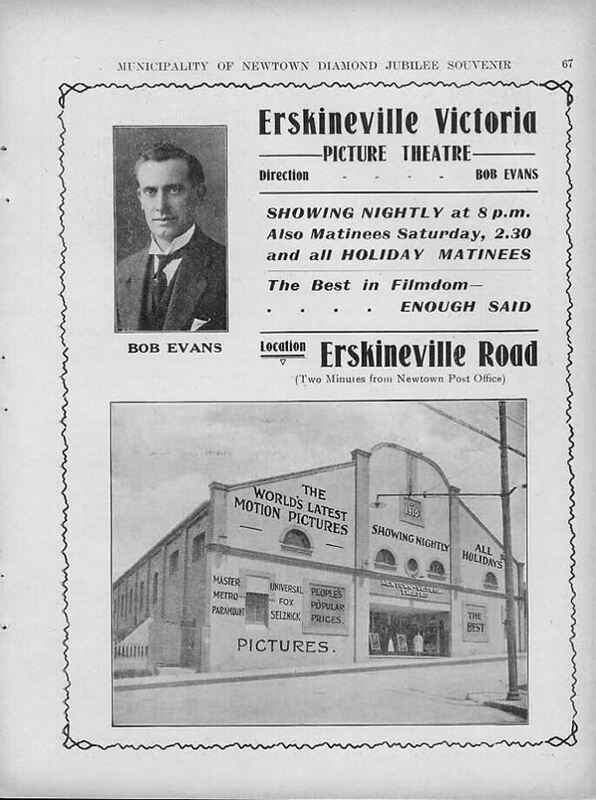 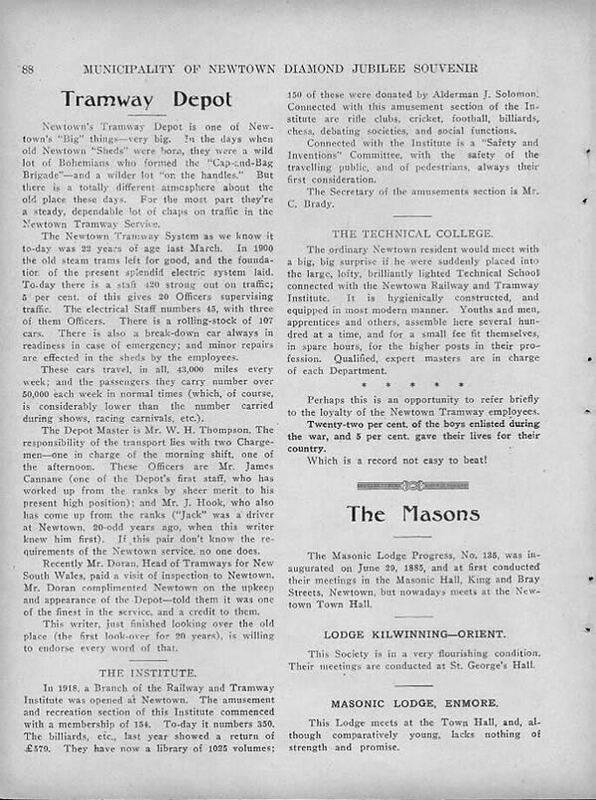 Next the booklet reviews ‘Our Romantic Past’ with tales of early settlers in the district, then moves on to descriptions of the tram depot, masonic lodges, local newspapers and musical societies (including the Newtown Band). 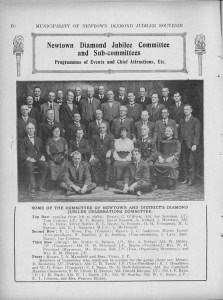 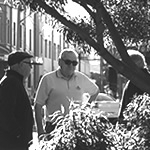 The various Friendly Societies operating in Newtown are then covered along with local bank branches. Then the Churches in Newtown are described, and the fire brigade. 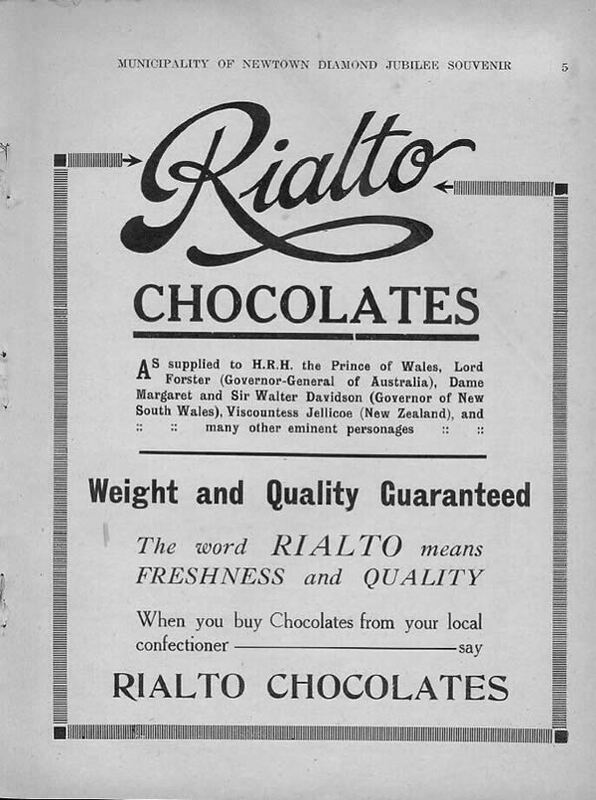 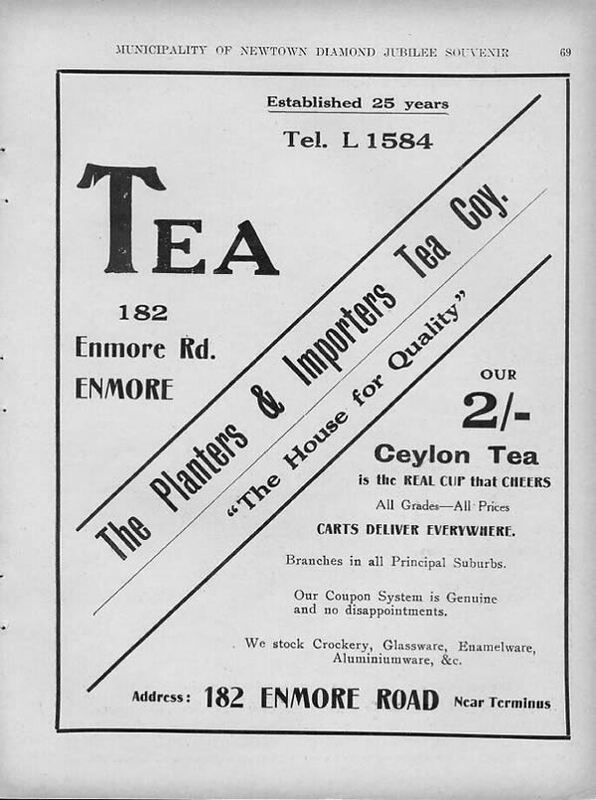 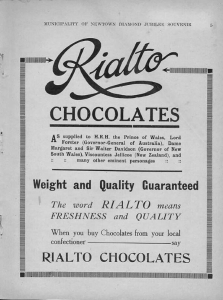 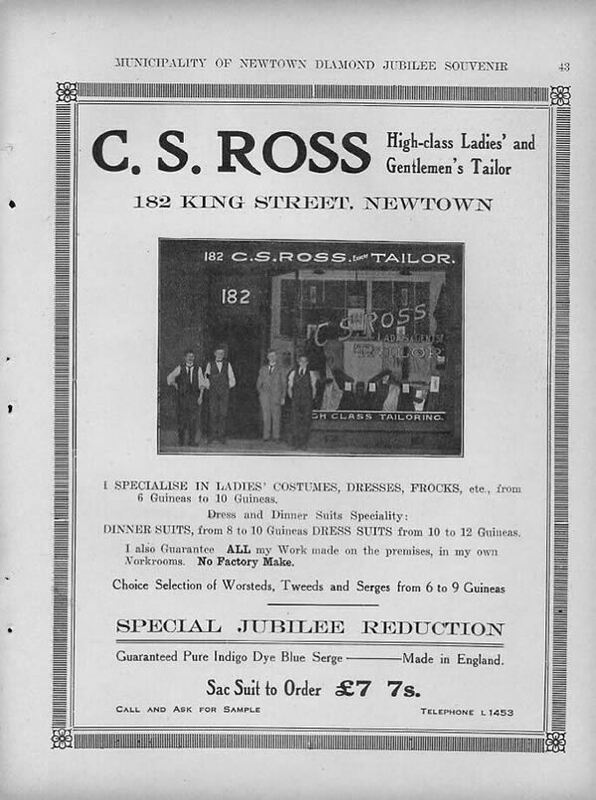 The final section of the booklet provides information about each of the firms and businesses that supported the Jubilee Souvenir Booklet by taking advertising space. 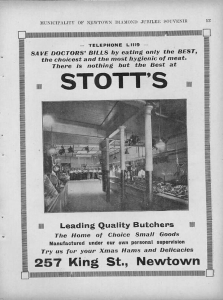 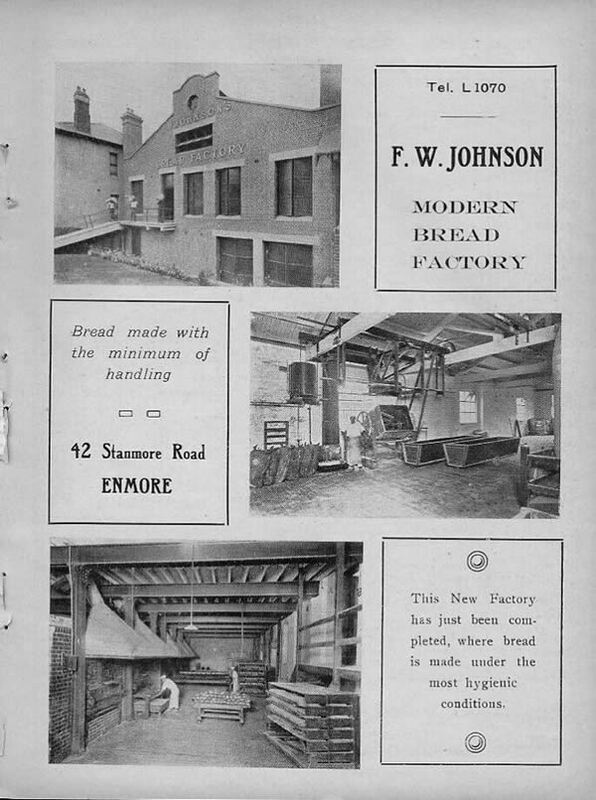 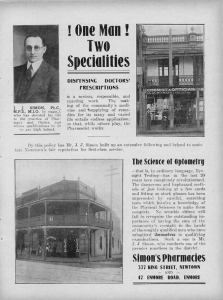 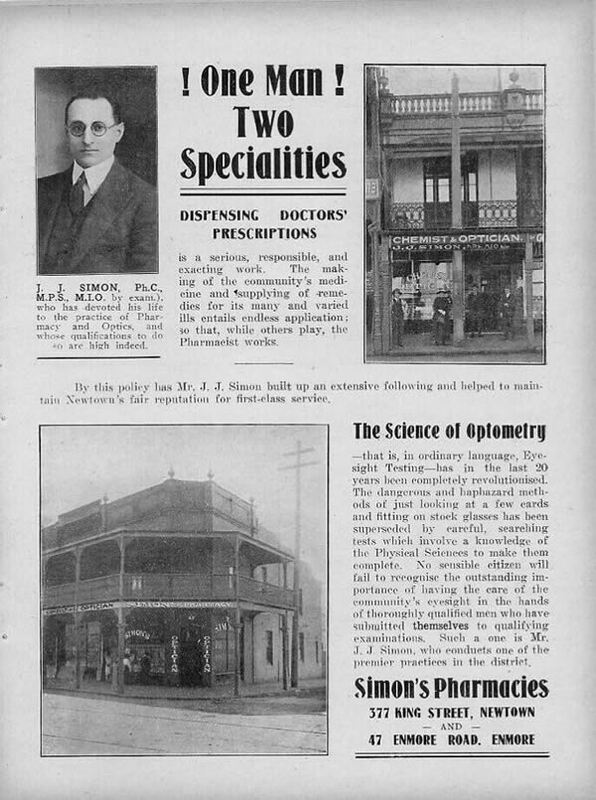 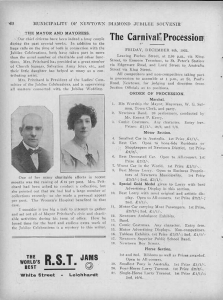 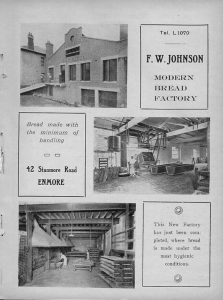 Page 96:- J. J. Simon, J. Pickles,R.S.T Preserving Co. 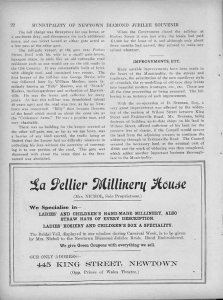 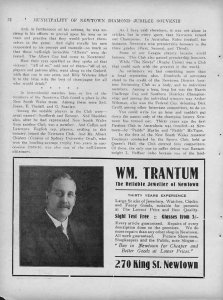 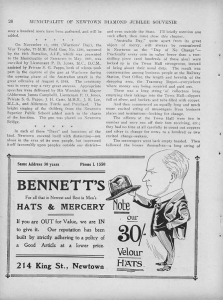 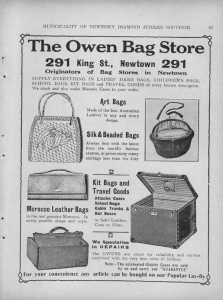 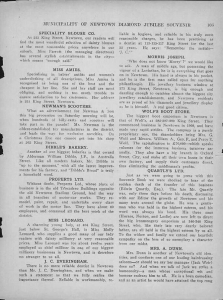 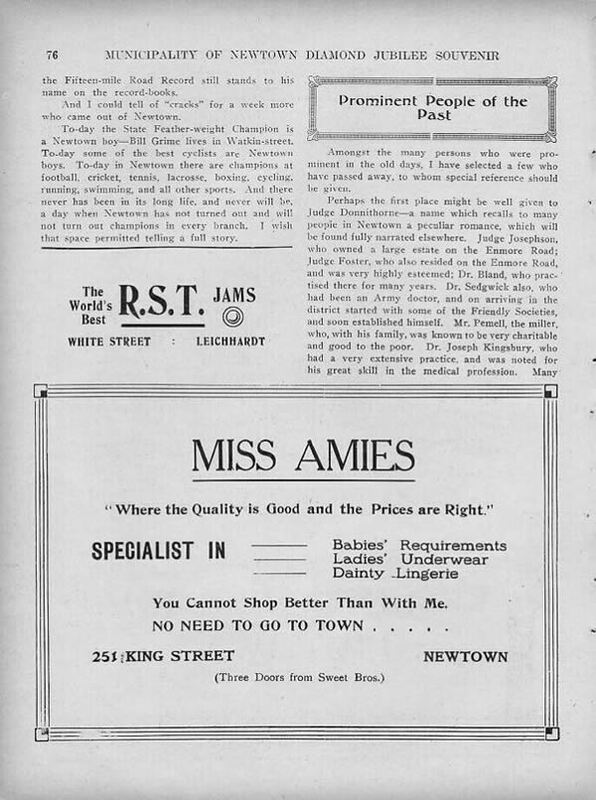 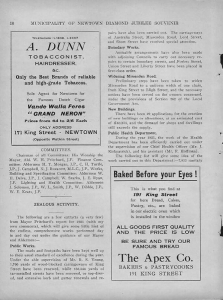 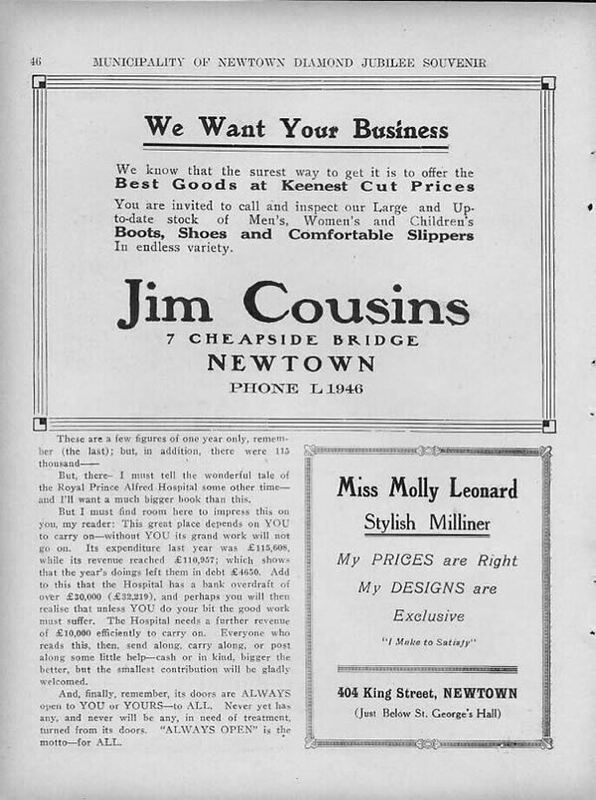 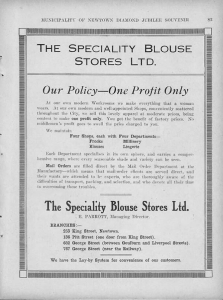 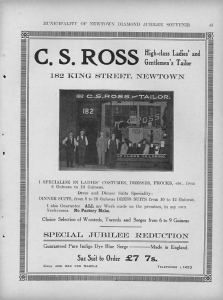 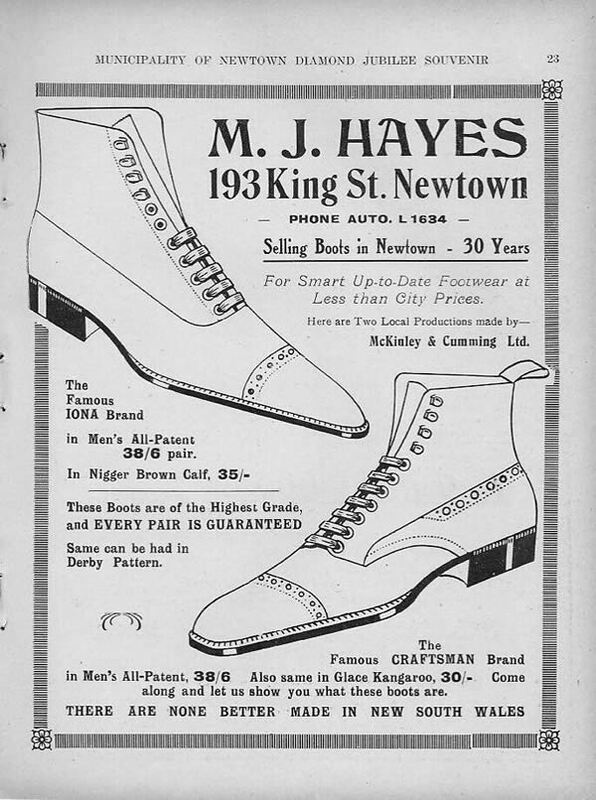 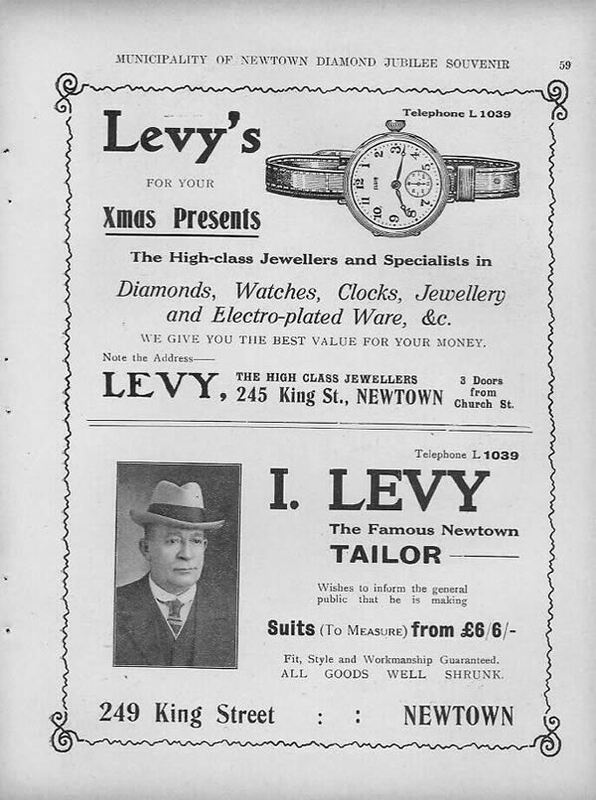 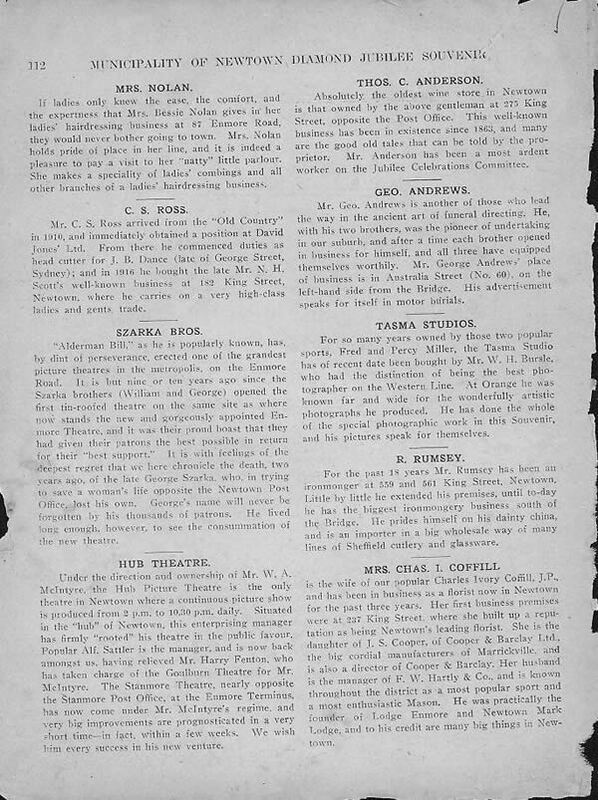 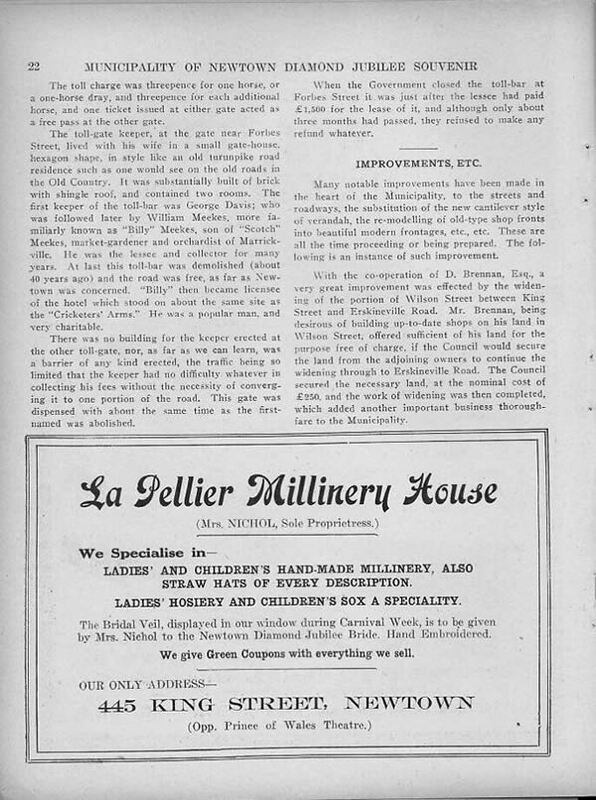 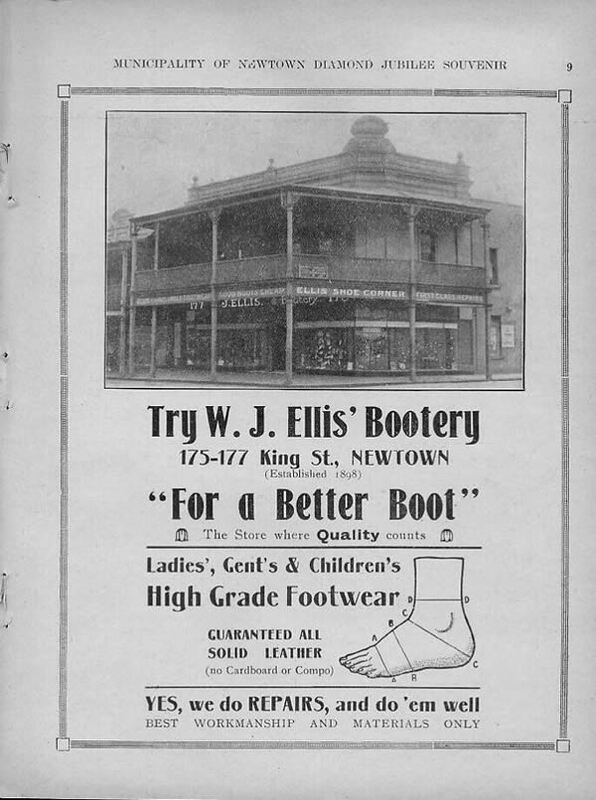 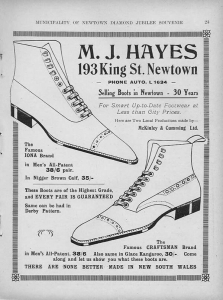 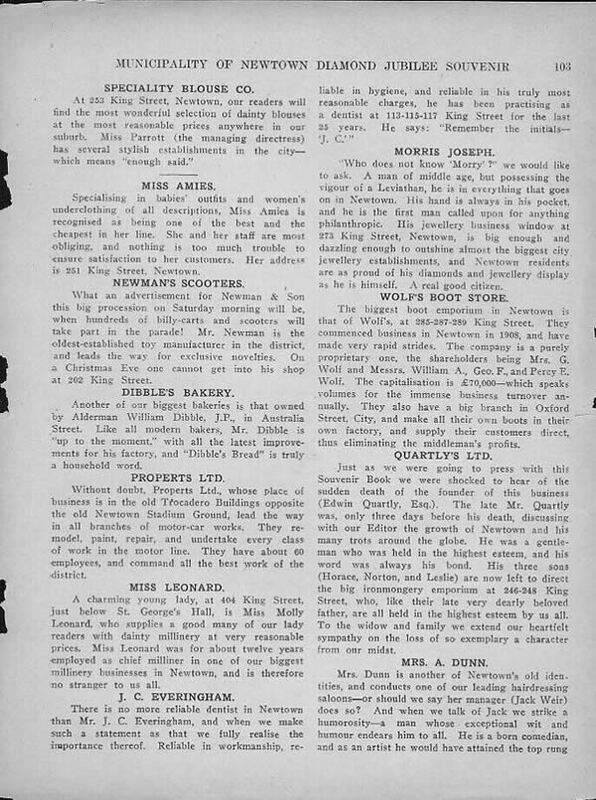 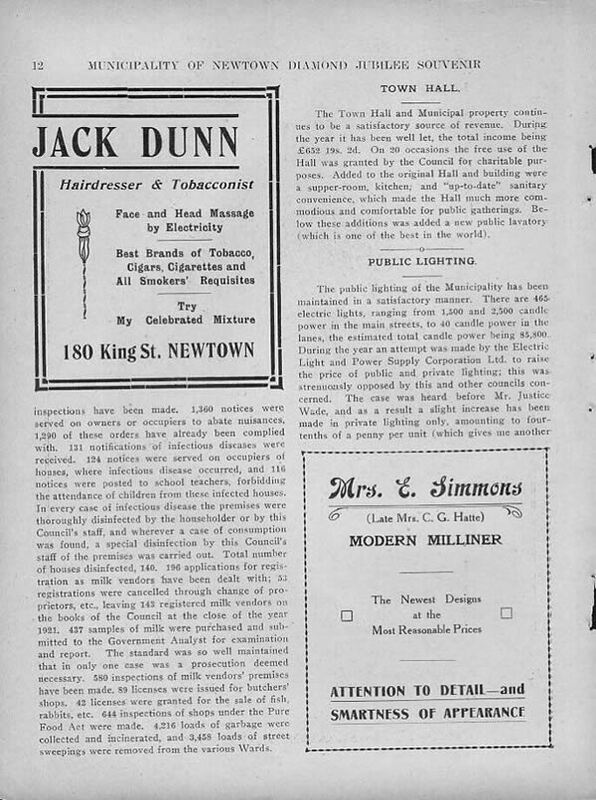 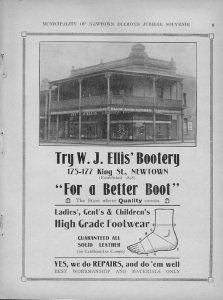 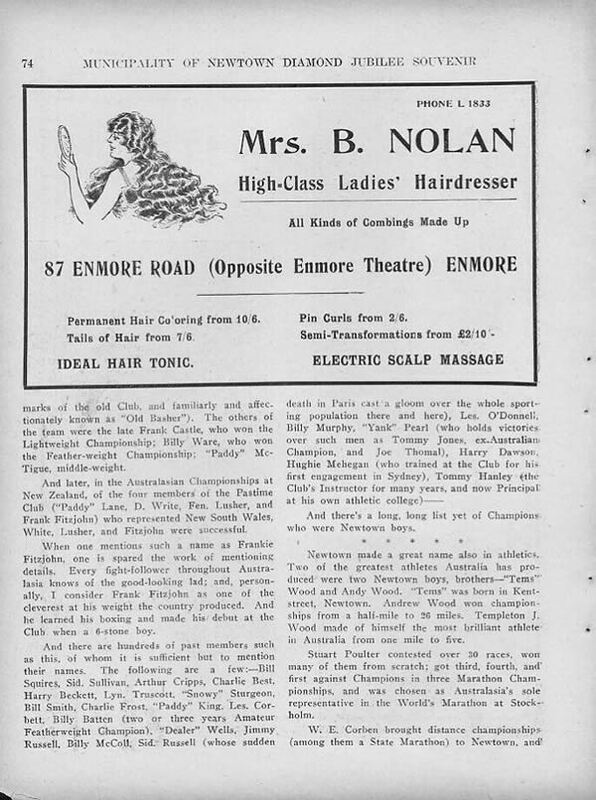 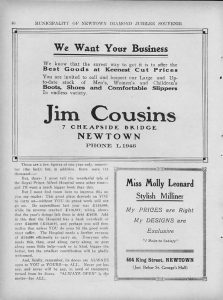 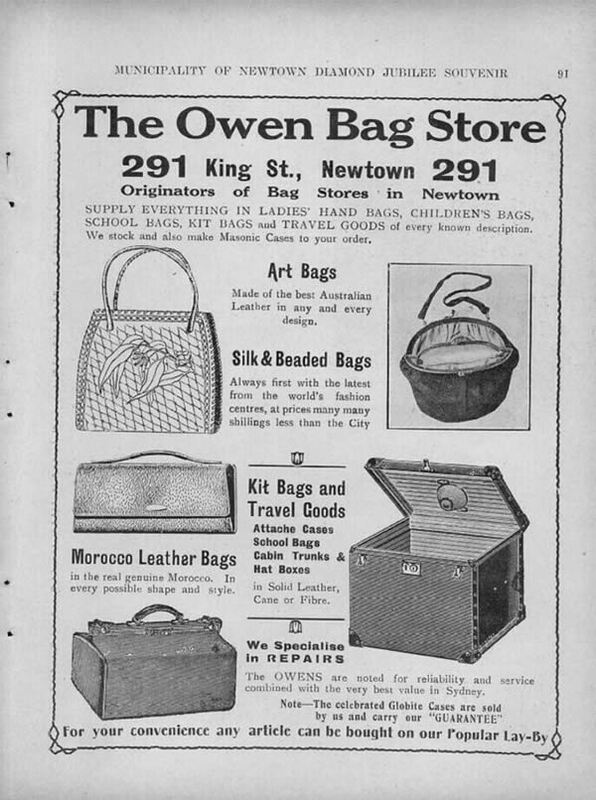 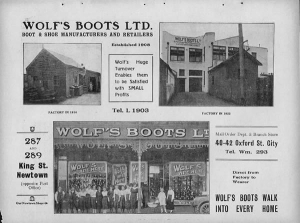 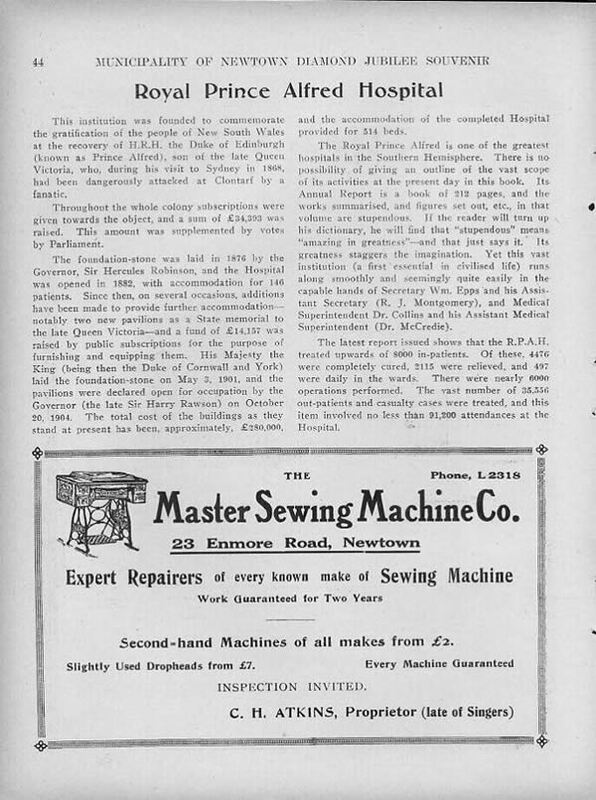 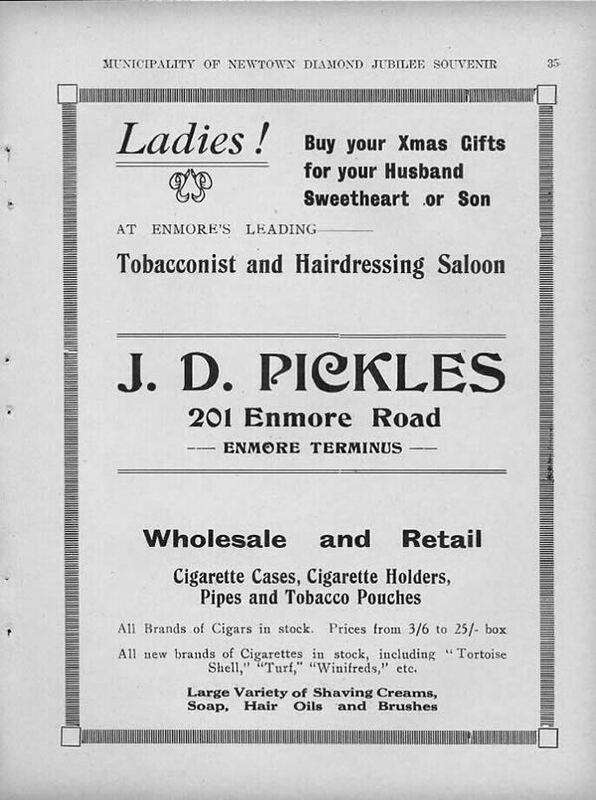 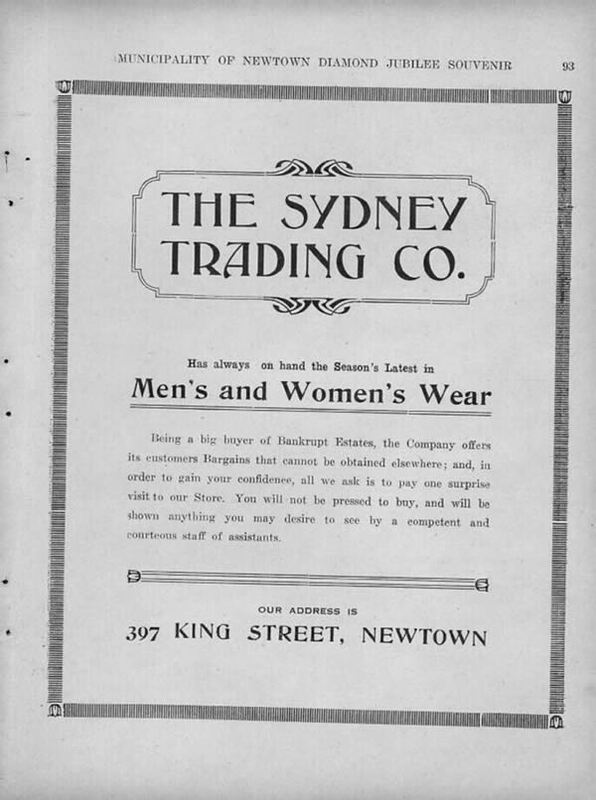 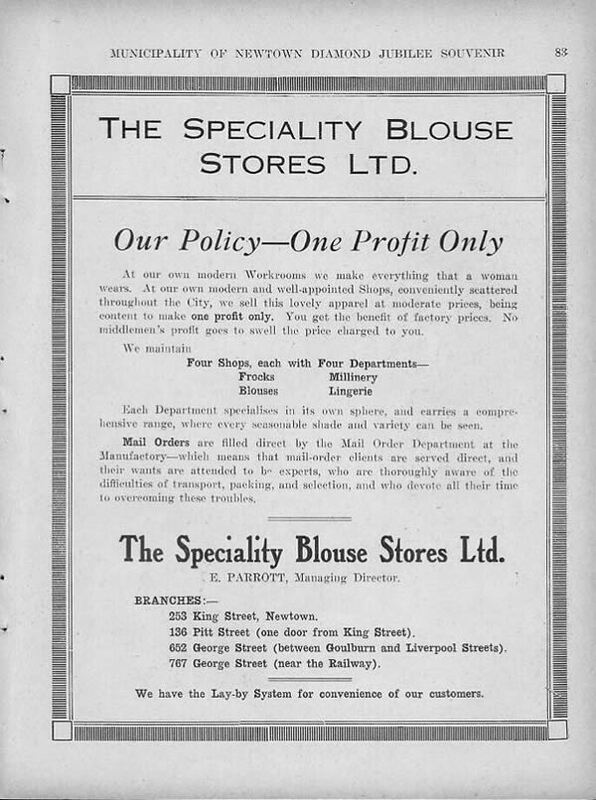 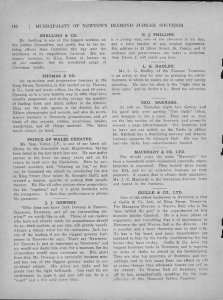 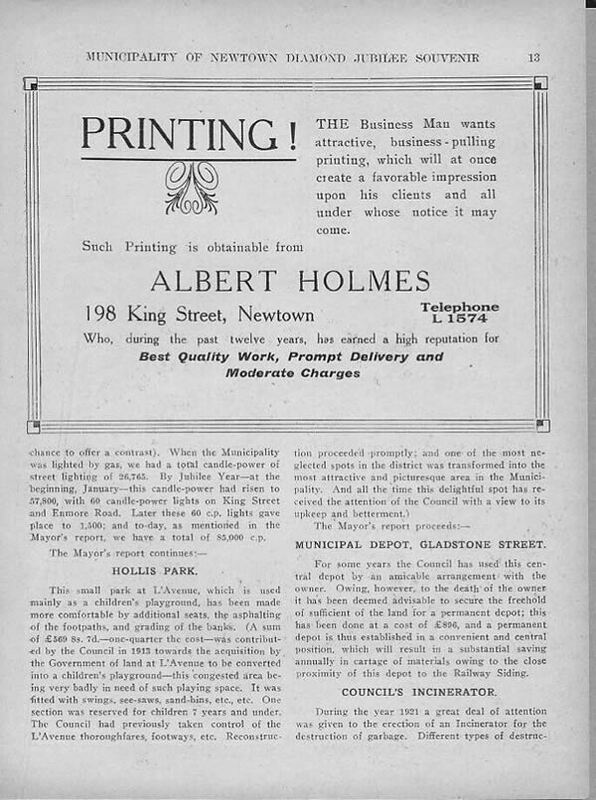 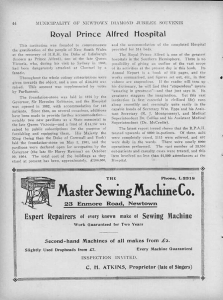 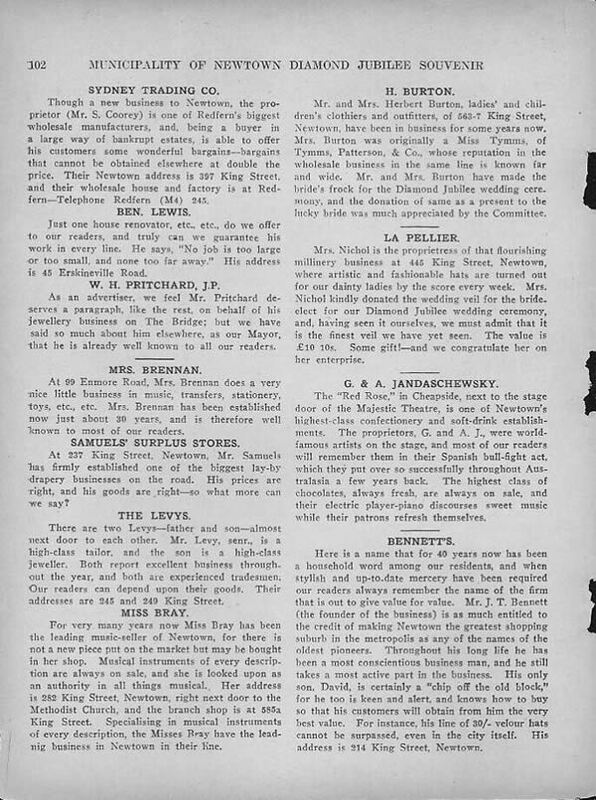 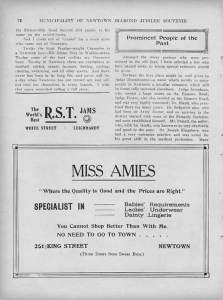 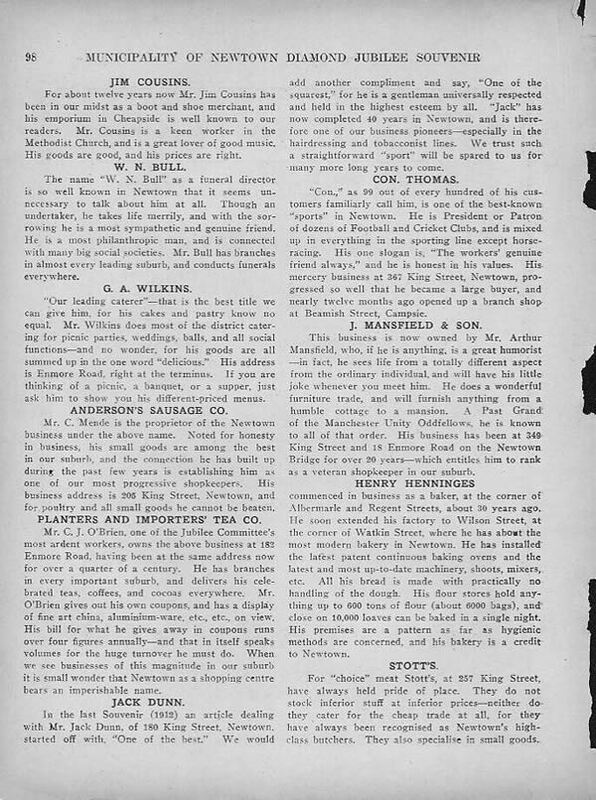 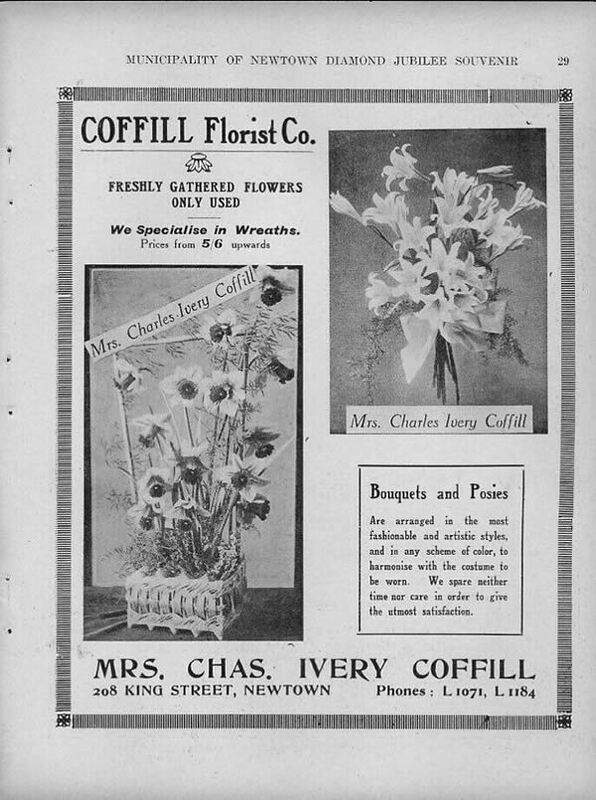 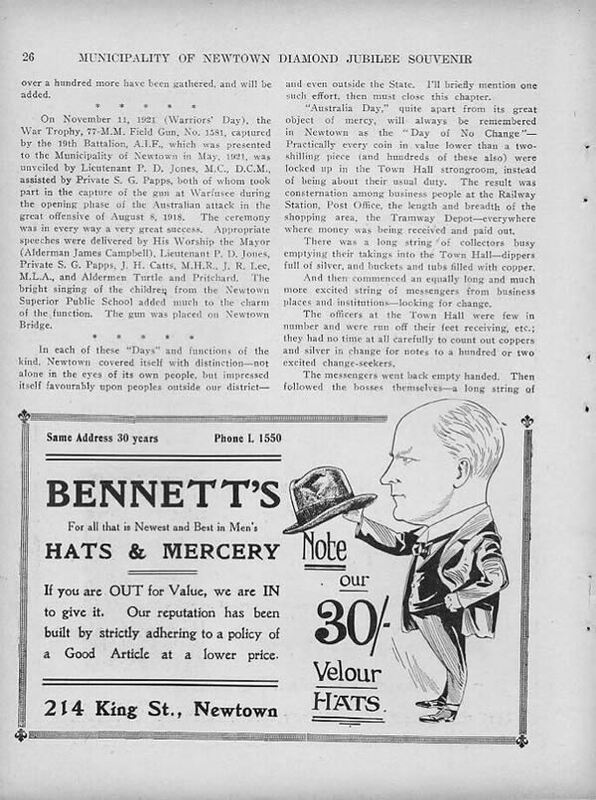 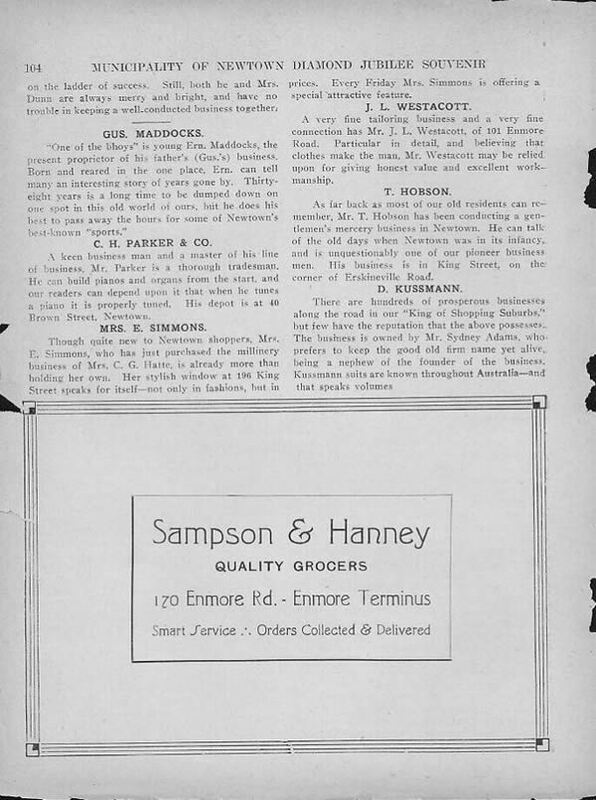 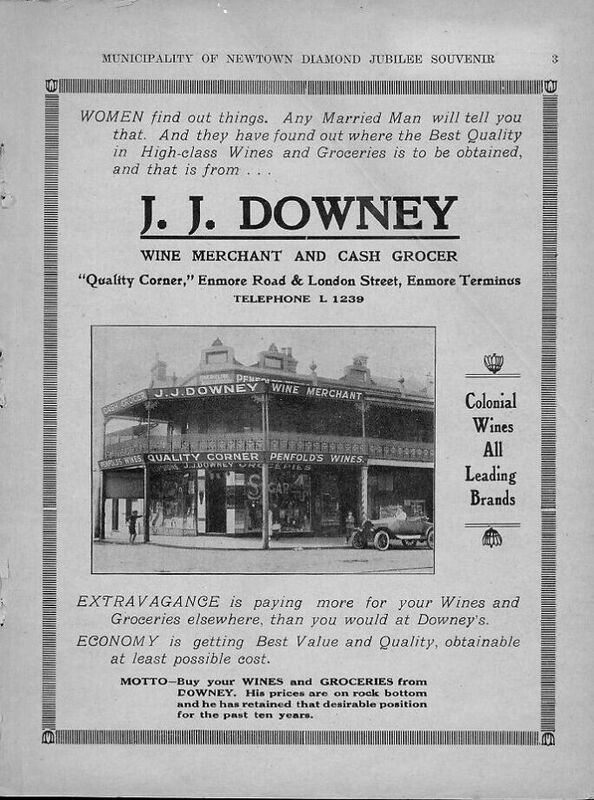 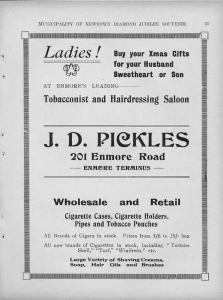 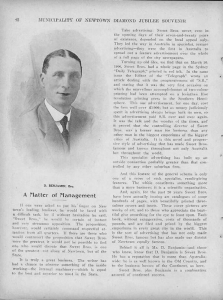 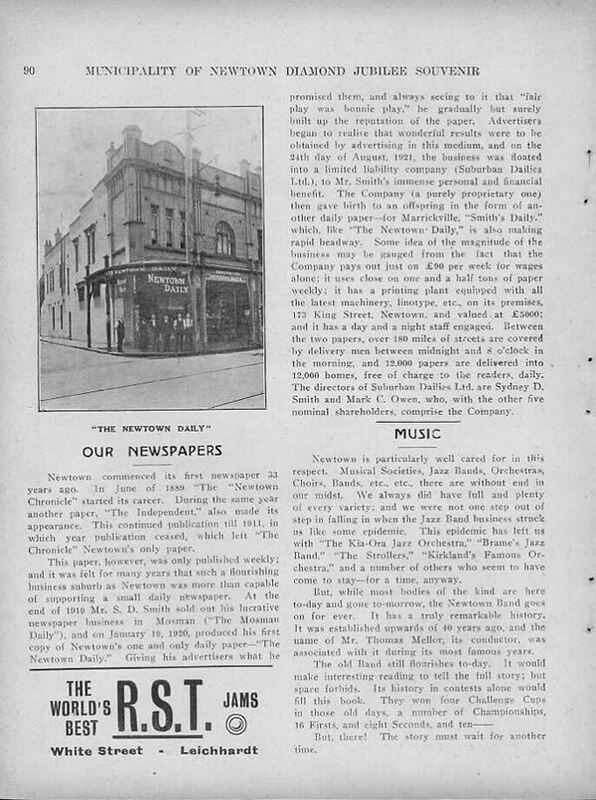 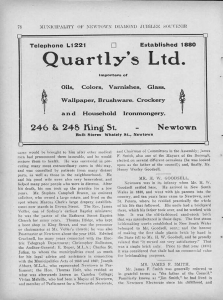 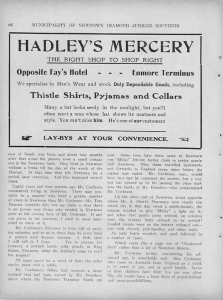 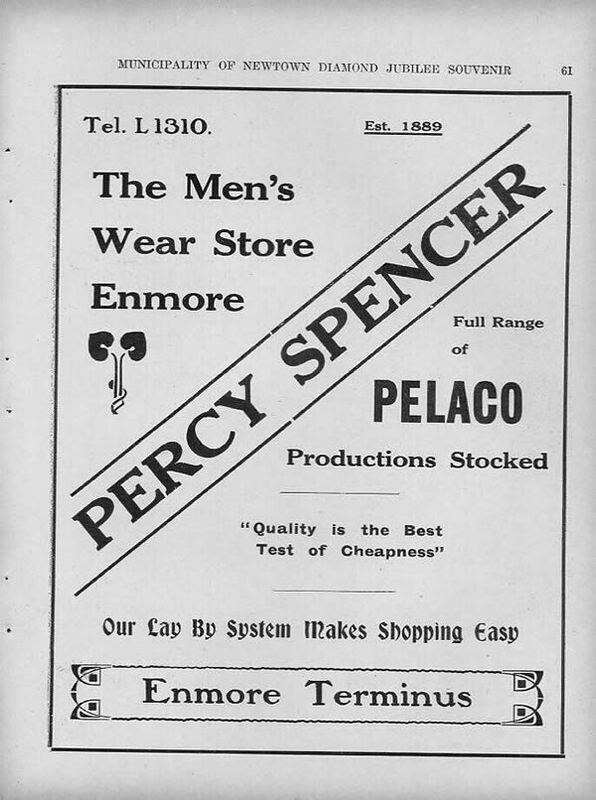 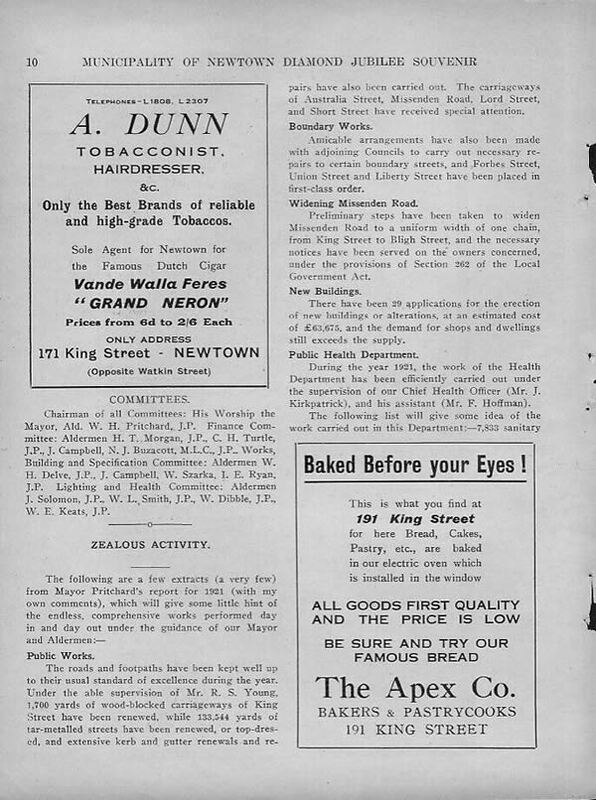 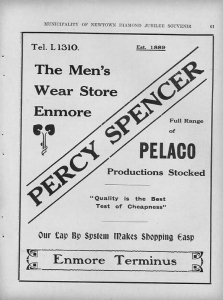 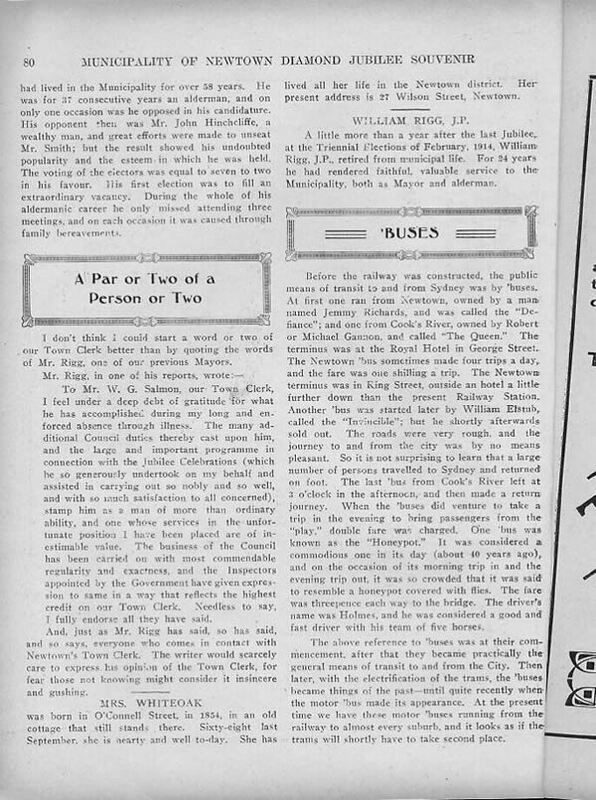 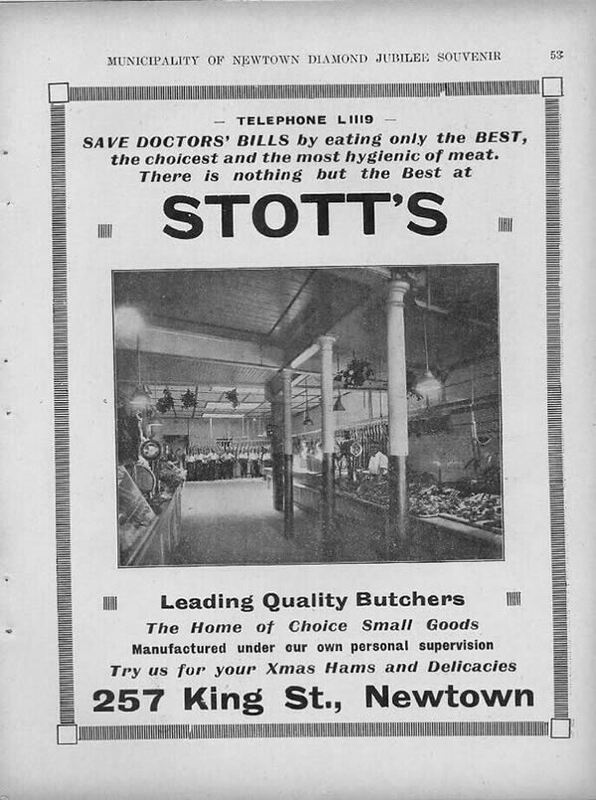 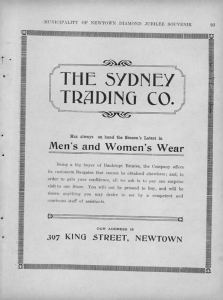 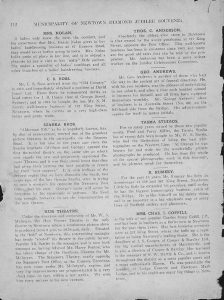 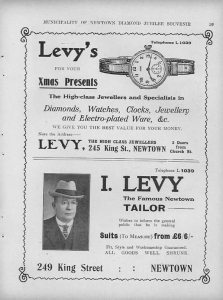 Page 103:- Speciality Blouse Co., Miss Amies, Newman’s Scooters, Dibble’s Bakery, Properts Ltd., Miss Leonard, J.C. Everingham, Morris Joseph, Wolf’s Boot Store, Quartly’s Ltd., Mrs. A. Dunn. 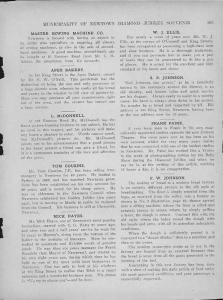 Page 107:- E. A. 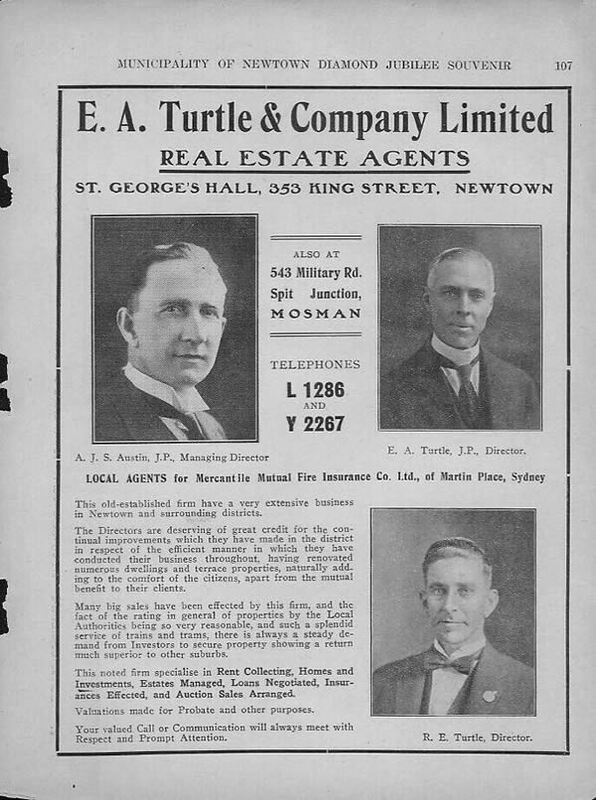 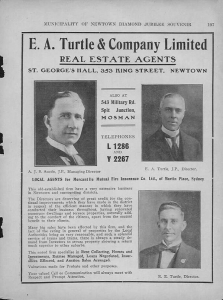 Turtle & Co. Ltd. 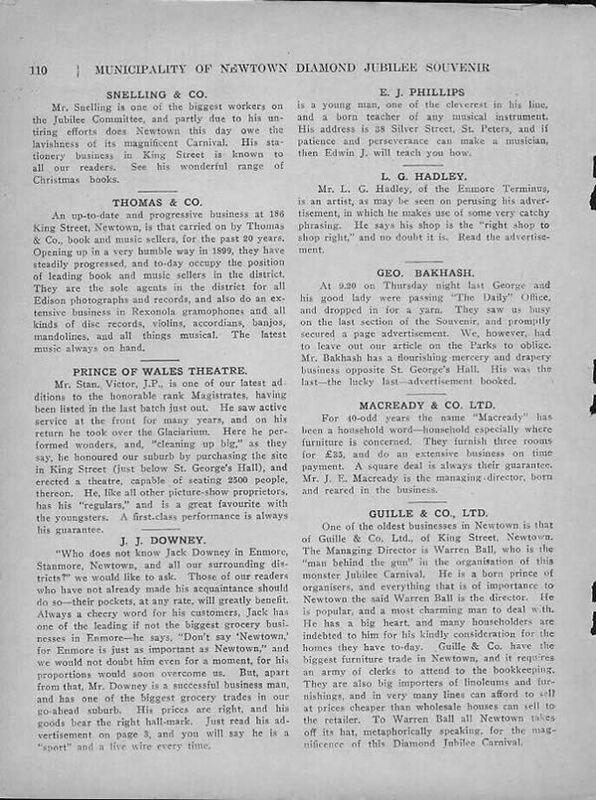 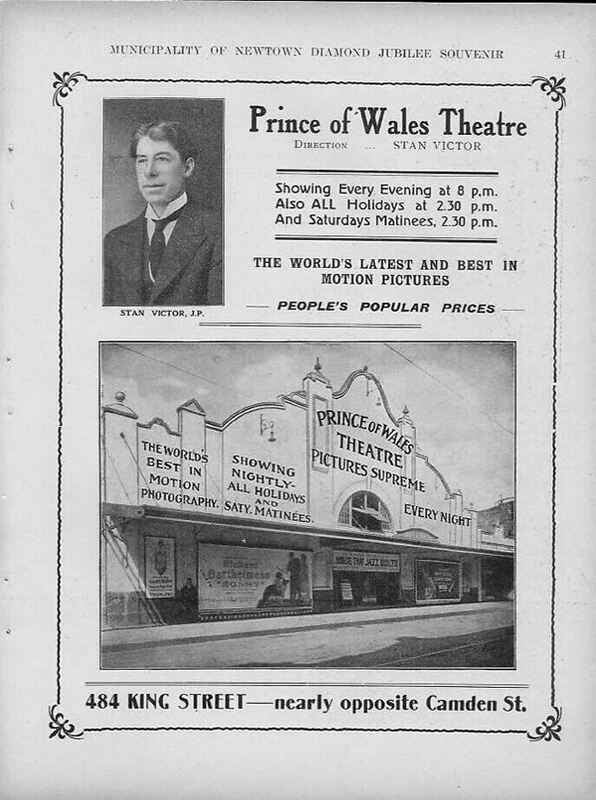 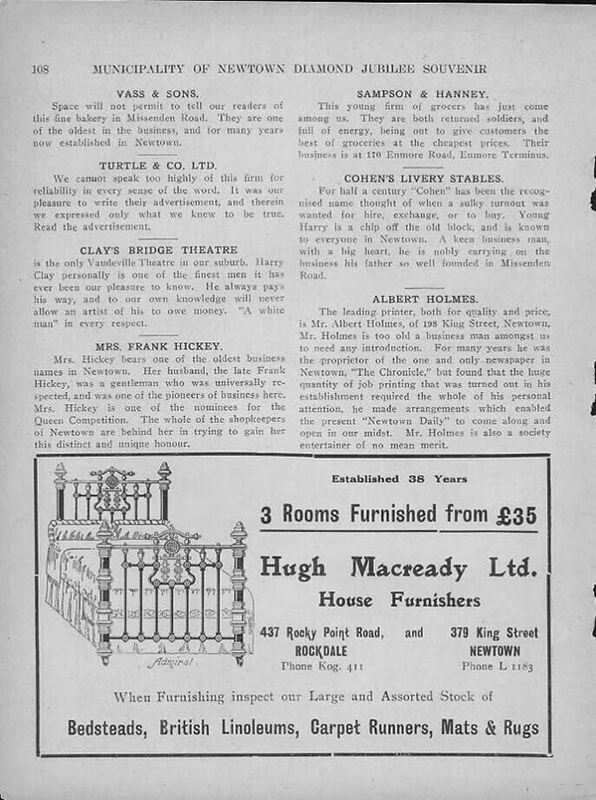 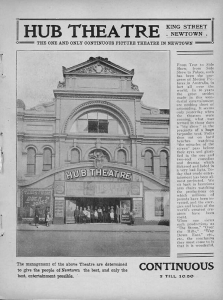 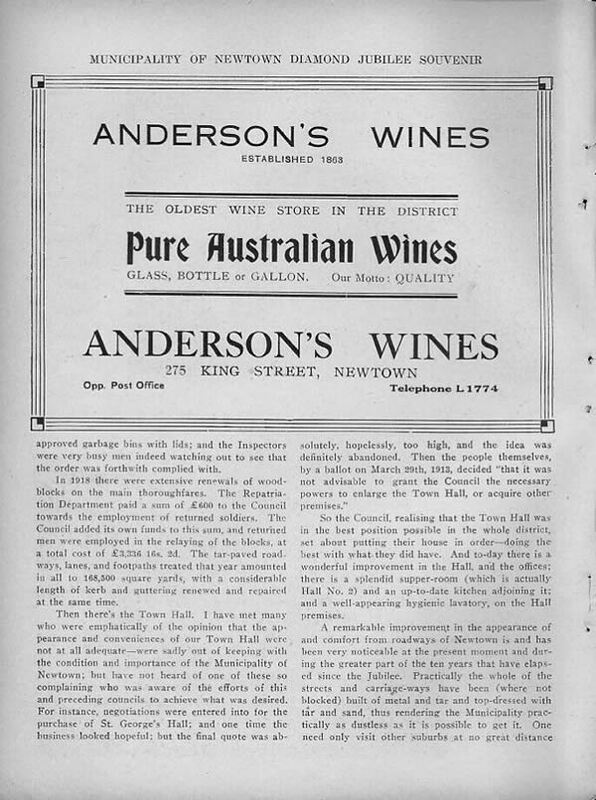 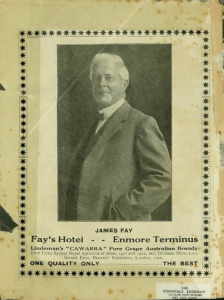 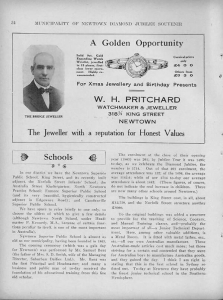 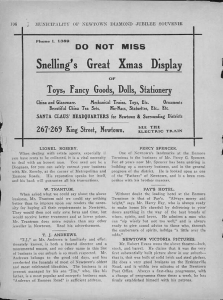 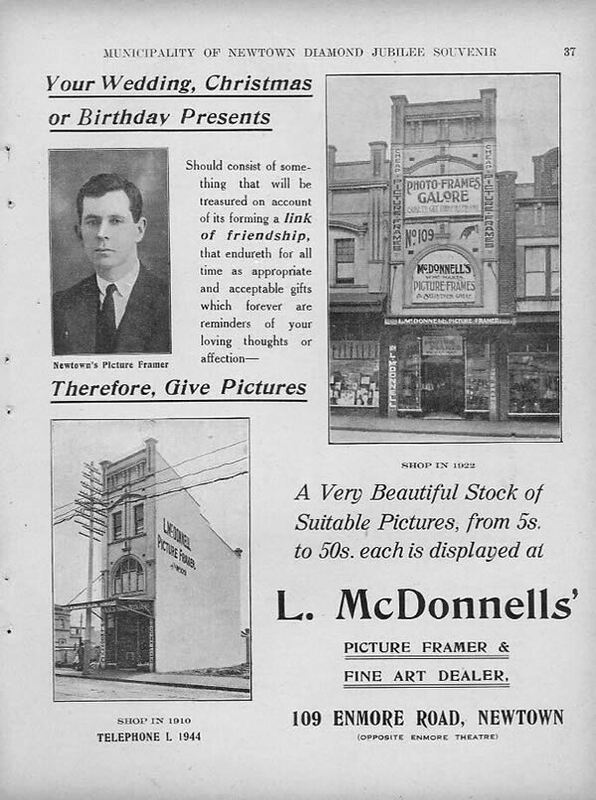 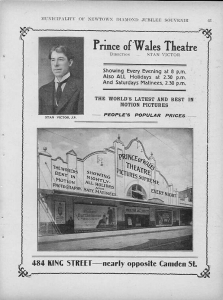 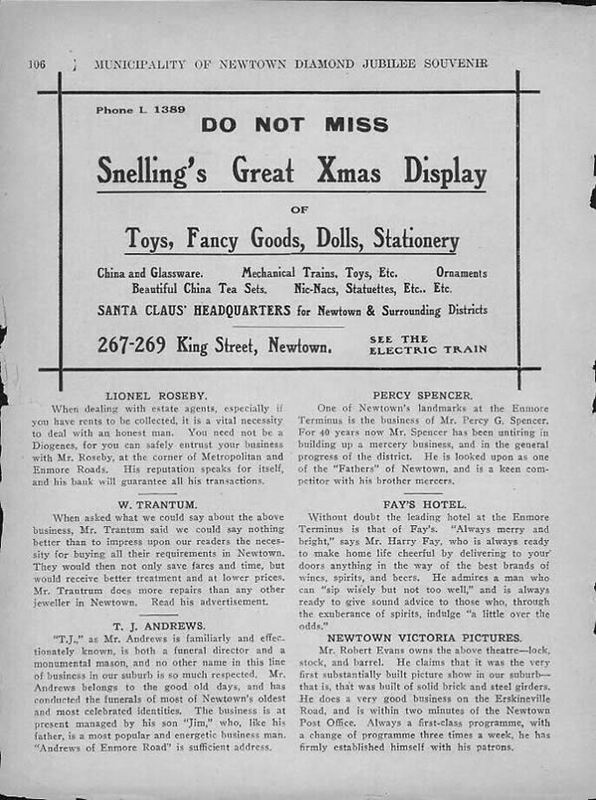 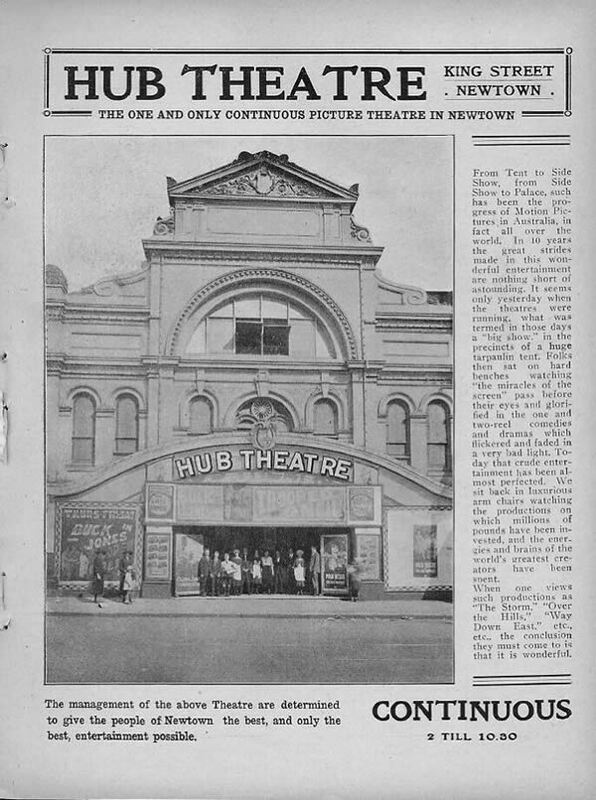 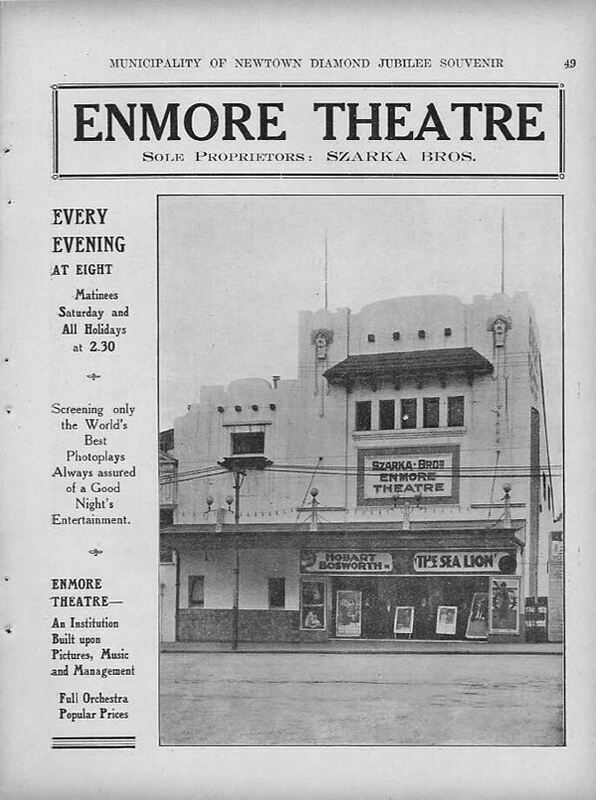 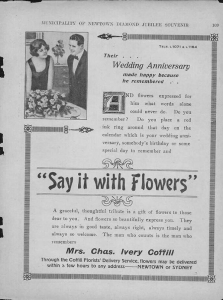 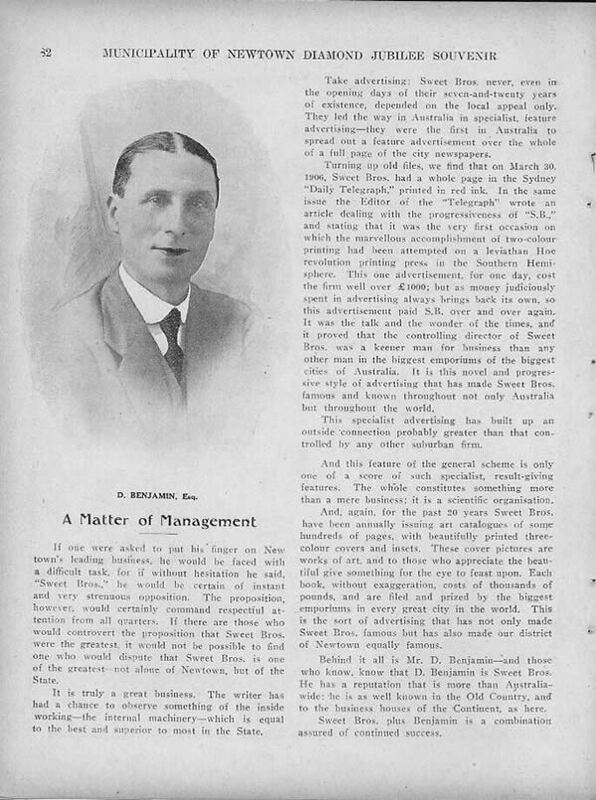 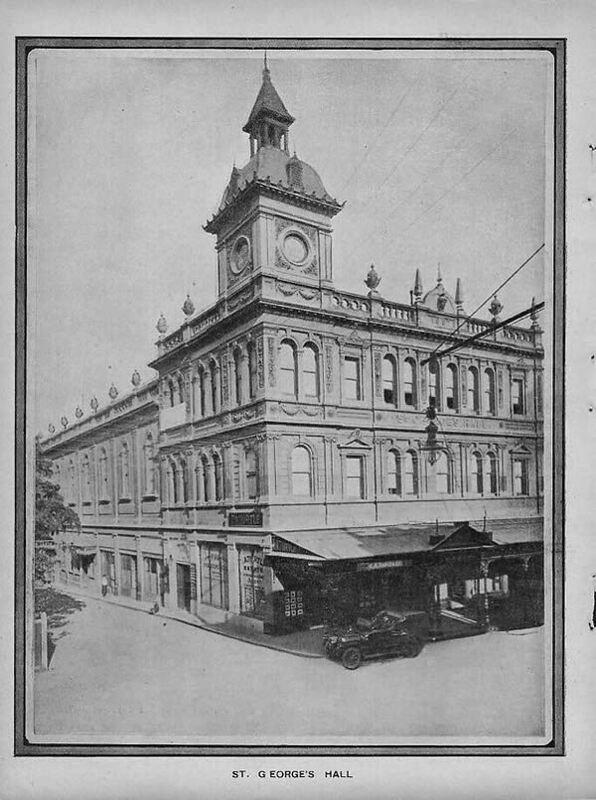 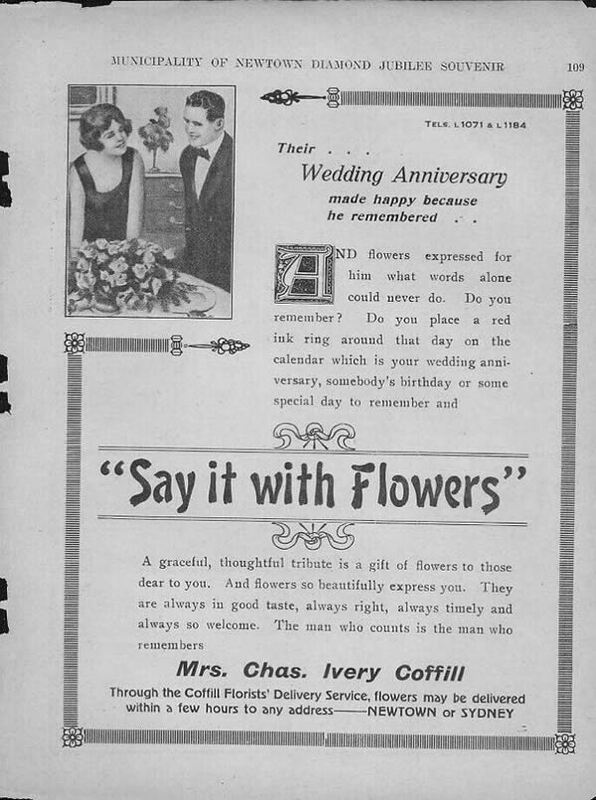 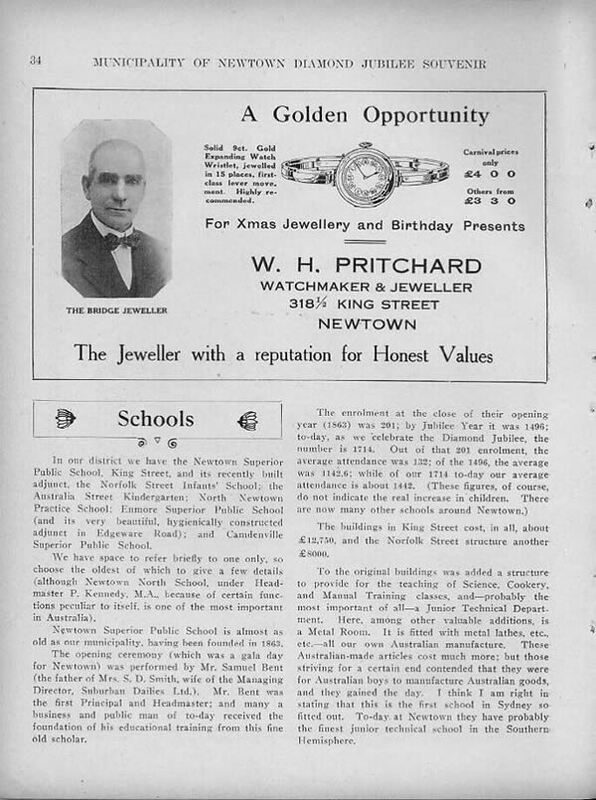 Page 110:- Snelling & Co., Thomas & Co., Prince of Wales Theatre, J.J. Downey, E.J. 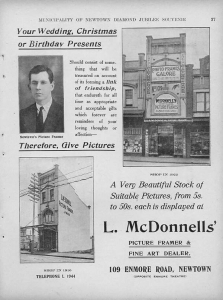 Phillips, L.G. 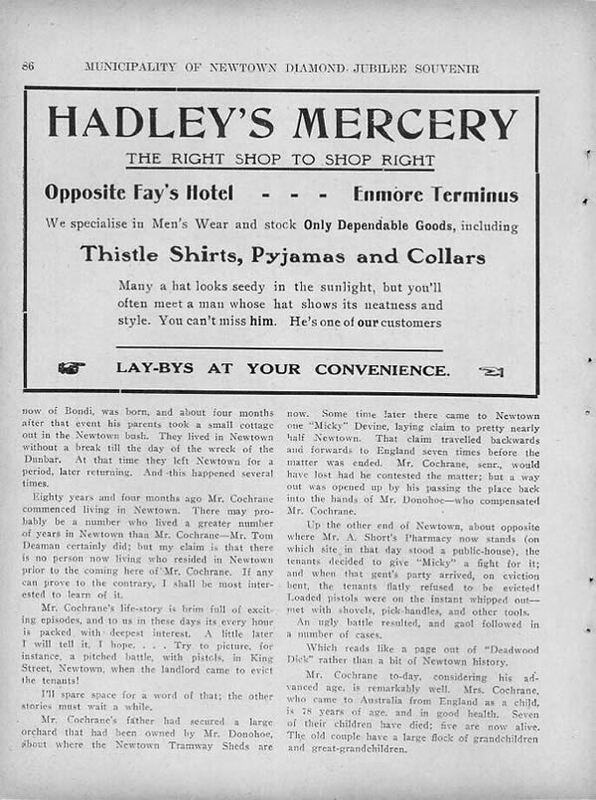 Hadley, Geo. 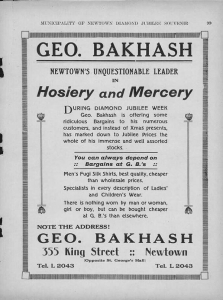 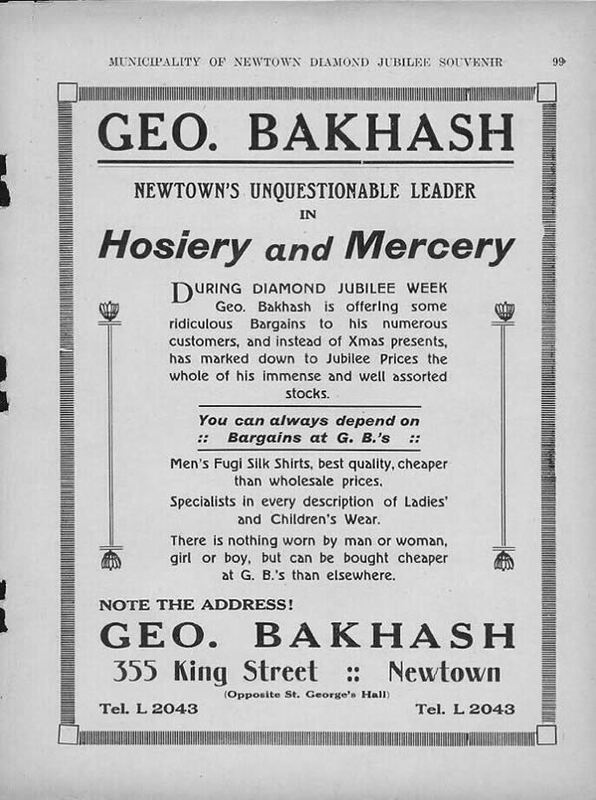 Bakhash, Macready & Co. Ltd., Guille & Co. Ltd. 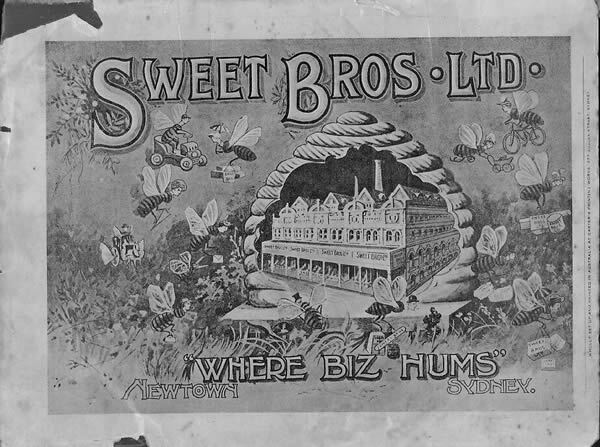 Page 114:- Sweet Bros. Ltd.